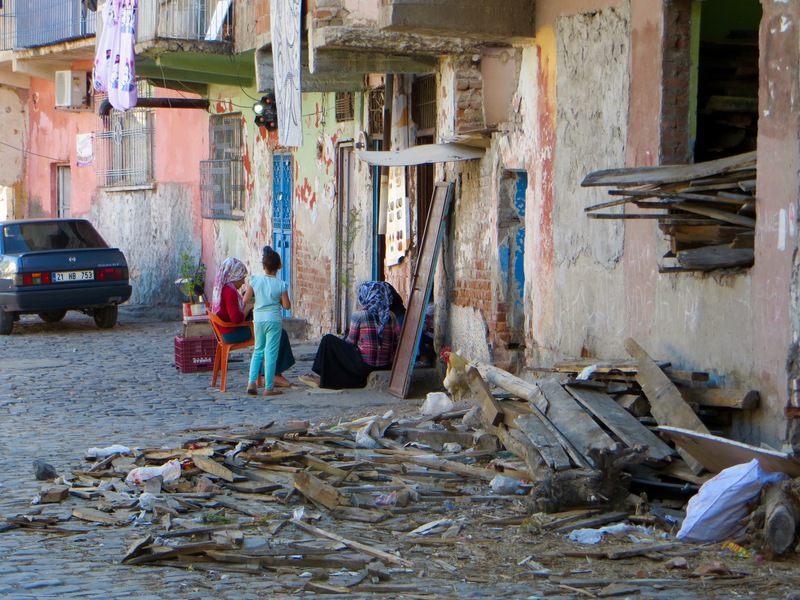 A trip to Eastern Turkey a hundred years after the "forgotten genocide". Postscript two: events between the two 2015 general elections and the November election result. Turkey launched overnight air strikes against several positions of the outlawed Kurdistan Worker’s Party (PKK) in northern Iraq for the first time in four years, the country’s government has said. The air raids put an end to a two-year ceasefire between the Turkish government and the PKK, severely endangering the already fragile peace process started in 2012 in an attempt to end a bloody conflict that has killed more than 40,000 people over thirty years. According to the office of the acting prime minister, Ahmet Davutoglu, the bombs hit several PKK targets in northern Iraq including shelters, bunkers, storage facilities and the Qandil Mountains, where the PKK’s high command is based. Turkish fighter jets also targeted Islamic State positions in Syria for the second night in a row, the statement said. In addition to the air raids, the Turkish military carried out artillery attacks against the Islamic State in Syria and the PKK in northern Iraq. 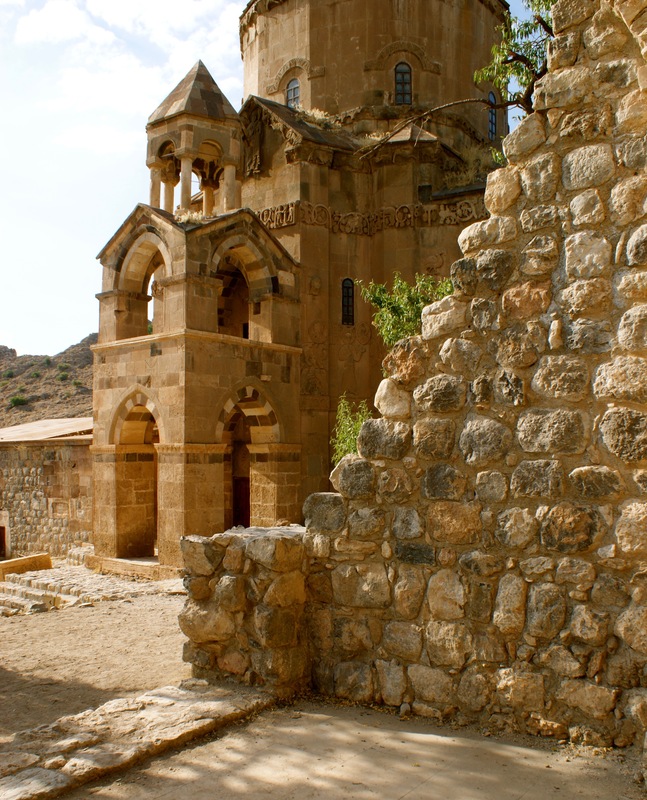 The Monastery of St. David, Aprank, near Tercan. “Strikes were carried out on targets of the Daesh (Islamic State) terrorist group in Syria and the PKK terrorist group in northern Iraq,” the prime minister’s office said, adding that all anti-terrorism operations were “carried out indiscriminately against all terrorist groups”. In a major tactical shift this week, Turkey decided to take a more active role in the US-led coalition fighting against the Islamic State, agreeing to open its air bases to allied forces as well as carrying out its own air raids. It is the first time Turkish fighter jets have entered Syrian airspace to attack Islamic State militants on Syrian soil. Previous air raids were conducted from the Turkish side of the border, according to the Turkish government. Speaking at a press conference on Saturday, Davutoglu said almost six hundred terrorism suspects had been detained in co-ordinated raids on Friday and Saturday, including people with alleged links to the Islamic State and the PKK. “I say it one more time: when it comes to public order, Turkey is a democratic state of law and everyone who breaks that law will be punished,” he said. In a first reaction to the attacks on their camps, the PKK leadership said that the ceasefire with Ankara had lost all meaning. “The ceasefire has been unilaterally ended by the Turkish state and the Turkish military,” said a statement on the PKK website on Saturday. “The truce has no meaning any more after these intense air strikes by the occupant Turkish army.” The group said the fallout and consequences of the overnight attacks would be disclosed later. Mesut Yegen, a historian on the Kurdish issue, said that it was too early to say that the peace process was over. “So far the PKK has not given the order to fighters on the ground to launch a counterattack, but it is clear that the peace process has been weakened substantially,” he said. It was unlikely that either the Turkish military or the PKK wanted an all-out confrontation. “As long as the attacks remain limited to the air strikes, there is hope that the peace process will continue,” Yegen said. The raids on both the PKK and the Islamic State came after a wave of violence swept across the country last week. On Monday, a suicide bomber killed thirty-one Kurdish and Turkish activists in the southern border town of Suruc in an attack that Turkish officials blamed on the Islamic State. After the bombing, tension has risen to dangerous levels in the predominantly Kurdish south-east, where many have long accused the Turkish government of directly supporting the Islamic State against the Kurdish struggle in Syria, a charge Ankara vehemently denies. Later in the week, the People’s Defence Force (HPG) – the armed wing of the PKK – claimed responsibility for the killing of two police officers in Ceylanpinar, a town on the Syrian border, in retaliation for the Suruc bomb. A policeman was killed in Diyarbakır on Thursday, while another officer was kidnapped there on Friday night. Violent protests against the ruling AKP’s failed Syria policies and their stalling of the Kurdish peace process have erupted in several cities across Turkey. In two subsequent anti-terror raids across Turkey, hundreds were detained on Friday and Saturday, including people with suspected links to the Islamic State and to the outlawed PKK. Ahmet Yildiz, a farmer and shepherd in Semdinli, a small town nestling between the Iranian and the Iraqi borders, said the sound of fighter jets kept his family up most of Friday night. 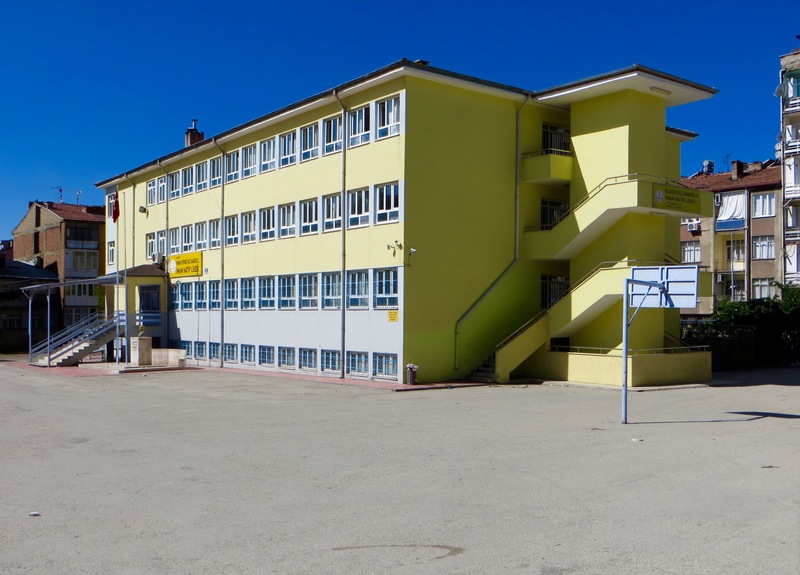 Late on Friday, PKK fighters attacked a local police station wounding three officers. Turkish President Recep Tayyip Erdogan has approved the make-up of the provisional government that will run the country until the 1st November elections, including for the first time pro-Kurdish MPs. Prime Minister Ahmet Davutoglu was tasked with forming a caretaker government earlier this week after he failed to form a coalition government following an inconclusive vote on 7th June. The two pro-Kurdish legislators are from the People’s Democratic Party (HDP), which for the first time managed to pass a 10% minimum vote threshold required for it to be represented in parliament in the June election. Davutoglu said HDP legislators Muslum Dogan and Ali Haydar Konca will become ministers in charge of development and of relations with the European Union. The ruling Justice and Development Party (AKP) lost its overall majority in parliament for the first time in thirteen years in the June polls. Erdogan appointed Davutoglu to form an interim “election government”, which, according to the constitution, must be made up of all parties represented in parliament. The cabinet spots are divided up according to the parties’ share of seats in parliament with eleven going to the AKP, five to the second-placed Republican People’s Party (CHP) and three a piece to the Nationalist Movement Party (MHP) and the pro-Kurdish HDP. Opposition parties have refused to take part in the interim government, making the HDP – which the government accuses of being a political front for the outlawed Kurdistan Workers Party (PKK) – and the AKP major partners in the new cabinet. In a deviation from the party line, MHP legislator Tugrul Turkes, son of the MHP’s founder, Alparslan Turkes, accepted an invitation to serve as a deputy prime minister in a move denounced by the party’s leadership. Davutoglu had to appoint non-partisan figures to fill the seats snubbed by the opposition parties. Selami Altinok, former Istanbul police chief, was appointed interior minister and foreign ministry undersecretary Feridun Sinirlioglu was named as the new foreign minister. The 1st November general election was a success for Erdogan and the AKP. It has been judged by European Union observers to be free but not fair because it took place in an atmosphere of fear and intimidation against a backdrop of escalating violence and the detention of government opponents, members of the media included. The AKP won an overall majority of 317 seats with 49.5% of the vote (in fact, the AKP secured about four million more votes in November than in June). The AKP won the election on a pledge to bring stability and security out of chaos, but a majority of voters conveniently ignored that Erdogan and the AKP were themselves the cause of the chaos in that they broke the ceasefire with the PKK, and directed more military might against the Kurds in Iraq and Syria than against the Islamic State. In my estimation, the election result is a disaster for Turkey. Why? Because it will unleash dangerously high levels of Turkish nationalism and give to the Islamists, whether moderate or otherwise, the power to push through reforms that make the state far more sympathetic to mainstream Sunni Islam than is already the case. All non-Turks and non-Sunni Muslims have reason to regret that the AKP’s decision not to negotiate seriously to create a coalition government following the June election has paid off, for the AKP at least, if not for anyone else. One of the few positive outcomes of the election was that the HDP won more than 10% of the vote (10.7%) and is therefore still represented in parliament, but its share of the vote declined from June and now it has only 59 MPs. 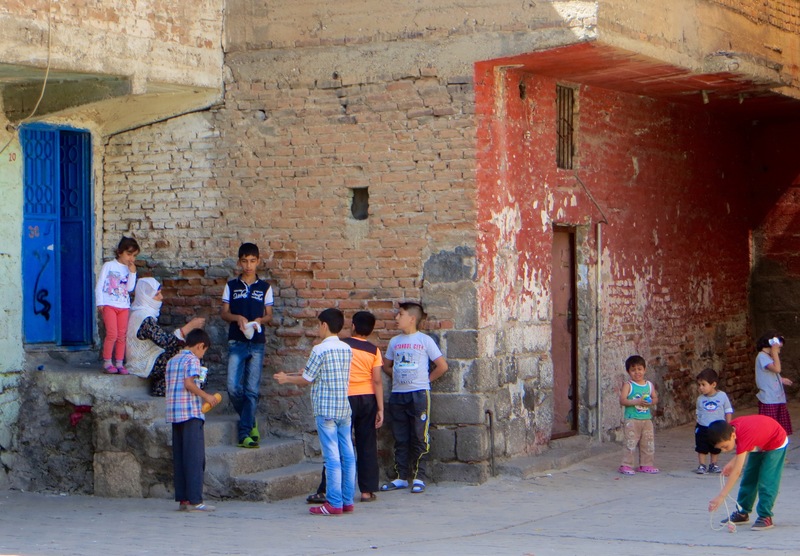 Perhaps inevitably, unrest in Diyarbakir followed. In Silvan, where some of the local Kurds had declared independence from the Turkish Republic, the result was greeted with considerable worry. In fact, across all of Turkish Kurdistan and in Tunceli province, majorities were deeply troubled that the AKP once again ruled alone. By the time we get to the next general election (unless one is called earlier than required), Turkey will have been ruled by one party, the AKP, for no less than seventeen years, despite the few months this year (late August to the end of October) when the provisional government was in power, a government that included non-AKP MPs (see above). Another positive outcome was that the AKP did not secure the 330 MPs required to call a referendum to amend the country’s constitution. Just for the record, the CHP secured 25.3% of the vote and 134 MPs and the MHP 11.9% of the vote and 40 MPs. A small number of people voted for parties that did not reach the 10% threshold required for representation in parliament. The percentage of women MPs declined from 18% to 14.7%. The “Today’s Zaman” website has an excellent chart revealing how many people voted for each party in every province. P.S. 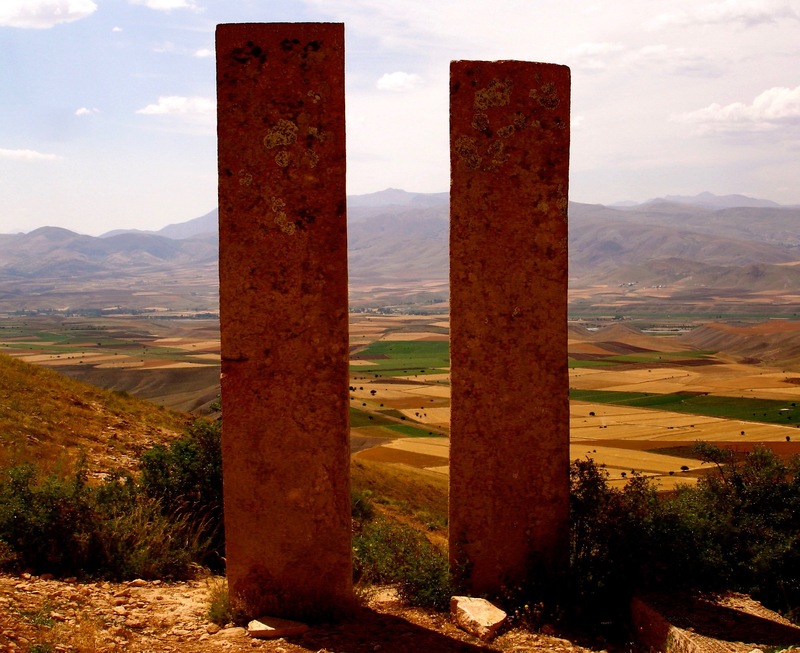 I recently read that Turkey would like the deserted medieval Armenian city of Ani, which overlooks the border with the Republic of Armenia east of the city of Kars, declared a world heritage site. Neglect and much worse mean that very little of this once-magnificent city remains, but here is further evidence that at least some Turkish citizens in positions of political authority recognise the importance of a few Armenian monuments, albeit primarily in the hope that, by preserving what remains, tourist revenues in a remote region will increase. Postscript one: the June 2015 general election and its aftermath. What eventually proved to be Turkey’s first of two general elections in 2015 took place on 7th June. At stake were the 550 seats of the Grand National Assembly. It was the twenty-fourth general election in the history of the Turkish Republic. Amid speculation that no party would win enough seats to govern alone, the result created the first hung parliament since the 1999 general election. The Justice and Development Party (AKP), which has governed Turkey since the 2002 election, lost its majority, but remained the largest party in the assembly with 258 seats and 40.9% of the vote. The AKP failed to win the 330 seats it needed to submit constitutional changes to a referendum and fell well short of President Erdogan’s personal target of 400 MPs. The Republican People’s Party (CHP) also fared worse than in the previous, 2011, general election winning 132 seats with 25.0% of the vote. Having been projected to win over many disaffected AKP supporters, the Nationalist Movement Party (MHP) improved on its 2011 performance by winning 80 seats with 16.3% of the vote. The new People’s Democratic Party (HDP), whose candidates had contested past elections as independents in order to bypass the 10% election threshold, fought the election as a party despite concerns that it might fall below the threshold and lose all its parliamentary representation. The HDP fared better than expected by winning 80 seats, the same as the MHP, with 13.1% of the vote. The indecisive result raised the prospect of an early snap general election. 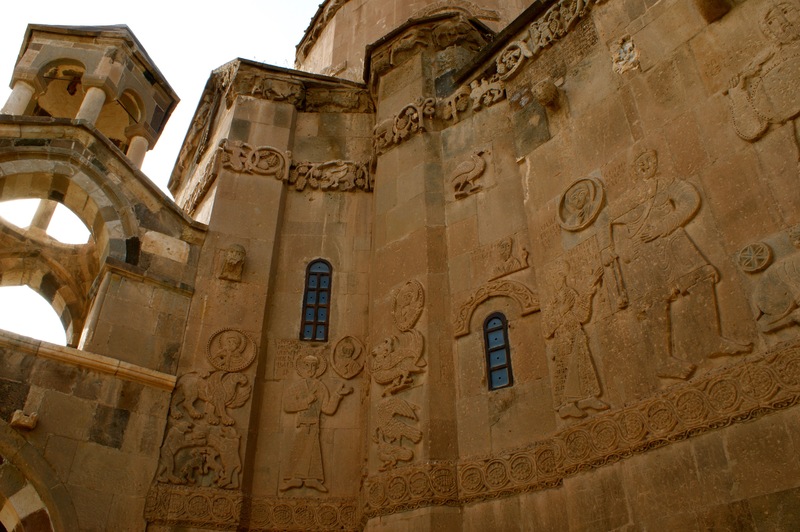 The Armenian church on the island of Akdamar/Aghtamar, Lake Van. Campaigning before the election focused mainly on the declining economy, the on-going Solution Process between the government and Kurdish rebels, the on-going political conflict with the Gulenist Movement and Turkish involvement (or, until July 2015 at least, the apparent lack of involvement) in the Syrian civil war. 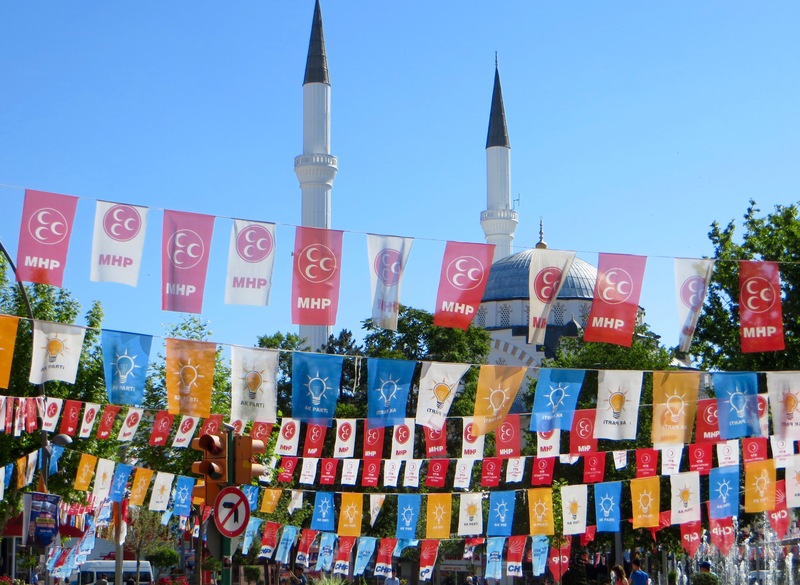 Allegations of government corruption and authoritarianism, mainly originating from a 2013 scandal and the 2013 Gezi Park protests respectively, were also issues raised during the opposition campaigns. The vote was seen by some people as a referendum on Erdogan’s call for an executive presidency. Accusations of electoral fraud and political violence also caused controversy during the election process. 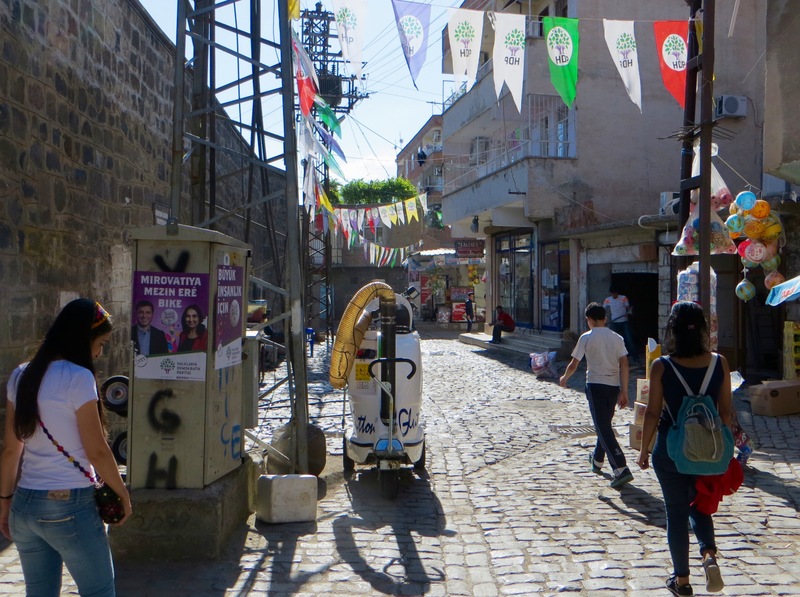 Candidates, activists, offices and motor vehicles were subject to politically motivated acts of violence and vandalism, culminating in the death of five HDP supporters after two bombs exploded during a rally in Diyarbakir on 5th June. The interference of Erdogan, who was accused of covertly campaigning for the AKP under the guise of “public opening” rallies, was also controversial because the president is constitutionally required to exercise political neutrality. Despite fraud claims dating back to the hugely controversial 2014 local elections and numerous claims of misconduct in many provinces on polling day, the election was largely praised by the OSCE for being carefully organised, and was declared free and fair by the European Parliament. The election result brought forth an embryonic new Turkey, but not the one the president wanted. It produced what is tantamount to a cultural revolution in Turkish political life. Women will pour (?!?) into parliament in Ankara in unprecedented numbers, 98 up from 79. Openly gay candidates won seats for the HDP. Most of all, the long-repressed Kurdish minority (one in five citizens) will be properly represented in the parliament for the first time with 80 seats. The HDP is the first party to introduce a quota of 50% female politicians, and all party offices and HDP-run municipalities are chaired by both a man and a woman. The party’s successful attempt to break out of ethnic identity politics and broaden its appeal well beyond the Kurdish issue owes much to leader Selahattin Demirtas’ magnetism and his message of outreach. But the mass protest movement, born in a central Istanbul park two years ago and which mushroomed into national protests that Erdogan crushed mercilessly, also fed into the HDP’s support. Just as Erdogan branded the protesters two years ago “riff-raff”, “terrorists” and “foreign agents”, in the election campaign he stoked division and malice by repeatedly smearing his HDP opponents as “terrorists, marginals, gays and atheists”. He asked religiously conservative voters not to cast their ballots for “such people who have nothing to do with Islam”. The tactic backfired as many religiously conservative Kurds shifted their votes from the AKP to a party that promised to represent everyone’s interests. A chart on the “Hurriyet Daily News” website about the June election result revealed the following about provinces in eastern Turkey. The HDP was the largest single party in Agri (79% of the vote), Ardahan (31%), Batman (73%), Bitlis (61%), Diyarbakir (80%), Hakkari (88%), Igdir (57%), Kars (45%), Mardin (74%), Mus (71%), Siirt (66%), Sirnak (85%), Tunceli (61%) and Van (78%). Of the provinces in which I spent time not already mentioned, the AKP was the largest party with 47% of the votes in Bingol, 54% in Elazig, 49% in Erzincan, 54% in Giresun and 59% in Sivas (Divrigi is in Sivas province). I was surprised to see that the AKP was the most popular party in Gaziantep and Sanliurfa, but not surprised that it was in Malatya, given how Sunni Islam has impacted so detrimentally on the provincial capital in recent years. Our many friends in Balikesir must have been livid that the AKP was the most popular party in that province in the west, and I was shocked to see that Rize had a higher percentage voting AKP (67%) than profoundly conservative and pious Konya (65%). In only one province, Osmaniye, did the MHP emerge as the most popular party, with the result that Osmaniye is somewhere I shall avoid for a while. The AKP remained the most popular party in all three of Istanbul’s electoral districts and both of Ankara’s, but the CHP was the most popular party in Izmir’s two electoral districts. By common consent, the AKP was seen as the most obvious loser and the HDP the most obvious winner. However, as the largest party in parliament, the AKP had the opportunity to form a coalition with one of the other parties, but it was doubtful it would wish to do so. The AKP had forty-five days following the declaration of the election result in which to form a government. If it could not form a government, or if the coalition collapsed sometime thereafter, the president could call another election. The difficulties the AKP had in forming a coalition government were as follows (although we now know that the AKP never seriously wanted to form such a government). The CHP was reluctant to enter a coalition with the AKP because the CHP remains Kemalist in outlook; in other words, its uncompromisingly secular inclinations render it almost impossible to contemplate collaboration with a religious party. The MHP would have loved to form a coalition with the AKP, but such a coalition, one embracing a Turkish nationalist party with links to shadowy extremist groups of a very violent nature, would definitely have derailed the AKP’s progress in recent years to woo the Kurds, a process which has made it very unlikely that civil war will begin again. The AKP would have found it impossible to work with the HDP because the HDP is as uncompromising in its commitment to secularism as the CHP and far more supportive of minority rights (ethnic, religious, sexual, etc.) than any mainstream party. Moreover, the HDP was now the leading representative of Kurdish interests in the Turkish Republic. The AKP believes (and I think the AKP is correct in its belief) that most Turks are not yet prepared to see Kurds in government, given that Kurds are still viewed by a majority of Turks as second class citizens who want to create from within the Turkish Republic a nation state of their own. There is also the legacy of the civil war and the fact that most Turks believe that blame for the war lies with the Kurds alone, and not with the decades of repression, discrimination and blatant denial of human rights predicated on government policies shaped by Turkish nationalism, Turkish nationalism dating from the birth of the republic itself. A remarkable thirty-two HDP members of parliament were women. The only party that did little to ensure women entered parliament in significant numbers was the MHP, which now had four women MPs. This said, women now made up 18% of members of parliament, up from 14% before the election. Filiz Kerestecioglu, who entered parliament for the HDP, is a lawyer and a women’s rights’ activist. Twenty-five years ago, she helped set up Turkey’s first shelter for women suffering domestic violence. The shelter soon emerged as the home of Turkey’s feminist movement. Filiz Kerestecioglu is reported to have said to the BBC that the increase in the overall number of women in parliament was “not satisfactory, but still, it is important”. My four companions had an appointment with friends in a distant suburb, so we went our separate ways. I spent more time in the narrow streets around the church, then went to examine the fortifications along the west side of the old city. I had just finished walking along some of the wall, when I heard people playing drums and a wind instrument that may have been a qernete. 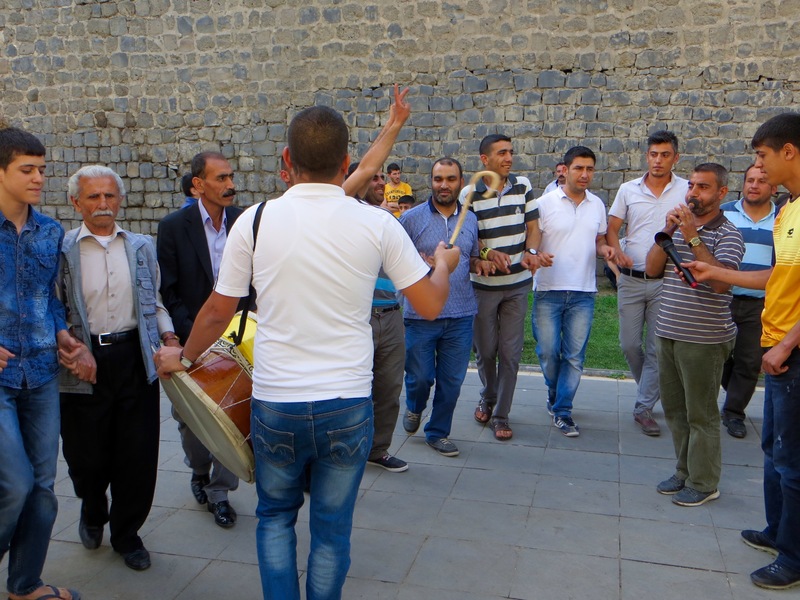 I walked toward the music where a group of Kurdish men and women had linked fingers to dance in a circle. They were supporters of the HDP and it was not long before I was added to the circle and photos were taken. About fifty people had gathered to look on. The pious Sunni women wore solemn expressions betraying contempt for what was going on or regret that they could not join in. Most or all of those taking part in the dance were secular in inclination. Dancing proved a delightful thing to do as the shadows lengthened with the approach of evening. 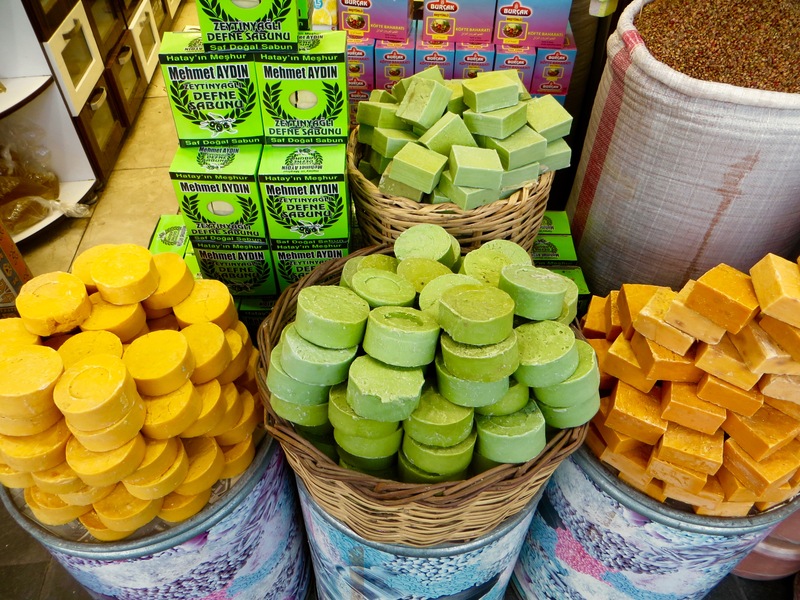 I waved goodbye to everyone and went quickly to Gazi Caddesi to buy some lokum, then, returning to the hotel, called at a supermarket to buy a large piece of kasar cheese and orange juice. After a quick shower and a change of clothes, I left for my last proper meal in Turkey itself, an Adana kebap at somewhere in which I had eaten during an earlier trip, Nasir Usta Lokanta just outside the old city on Ali Emiri Caddesi. I ordered a one and a half portion of Adana kebap and ayran knowing that water and salads would be brought as free extras. In fact, six free dishes arrived, one with slices of lemon and coriander, one with pulped tomatoes, one with tomatoes and lettuce, one with fresh onion, pepper and coriander, one with yoghurt and bulgar, and one with three portions of cig kofte. The lokanta was busy inside and out with many customers decidedly middle class in appearance. Based on the appearance of the children and women alone, most customers were secular in outlook or very relaxed about their commitment to Islam. With time to spare I delayed departure, not least because I was given a glass of tea to end the meal. Nasir Usta Lokanta proved a fitting place to end the trip, given the quality of the food and the crisp and clean, female-friendly surroundings. 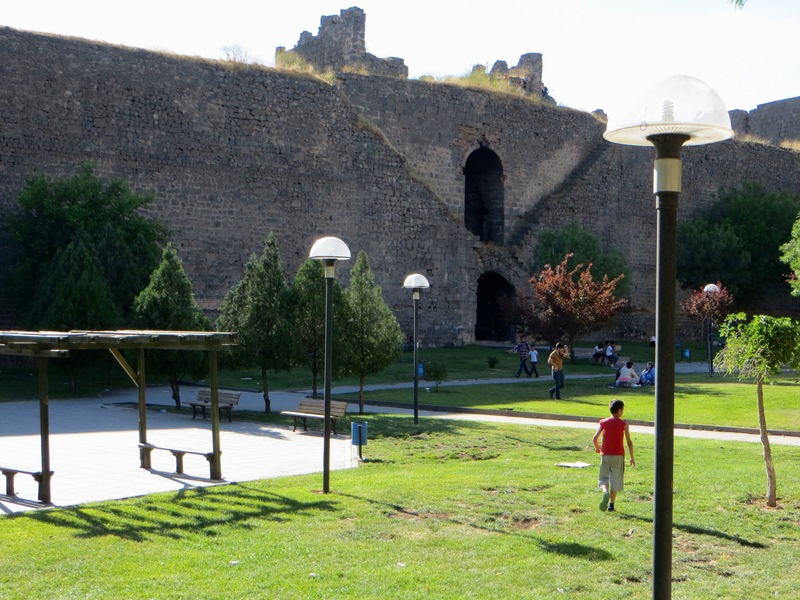 It was not quite the trip’s best meal – my first meal in Sebinkarahisar and the late lunch in Solhan were better, partly because of the novelty of some of the food available – but I was delighted with what I had. 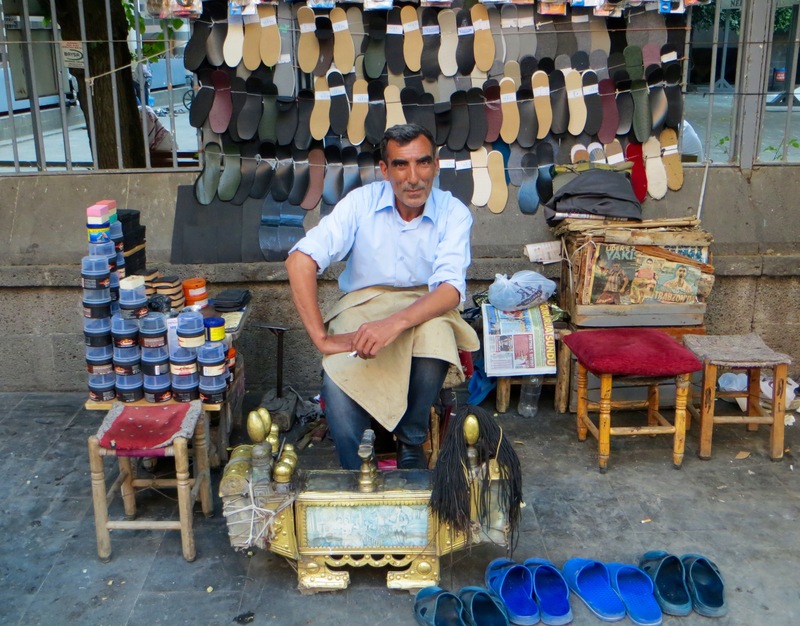 I went for one last walk around the old city concentrating on the area near the Ulu Camii and Nebi Camii, the latter mosque being where, even on a Sunday evening, about a dozen men sat among their boxes, tins and other necessities to polish or repair shoes. It would soon be dark, but quite a lot of young women still walked around, albeit in the company of male relatives or friends. 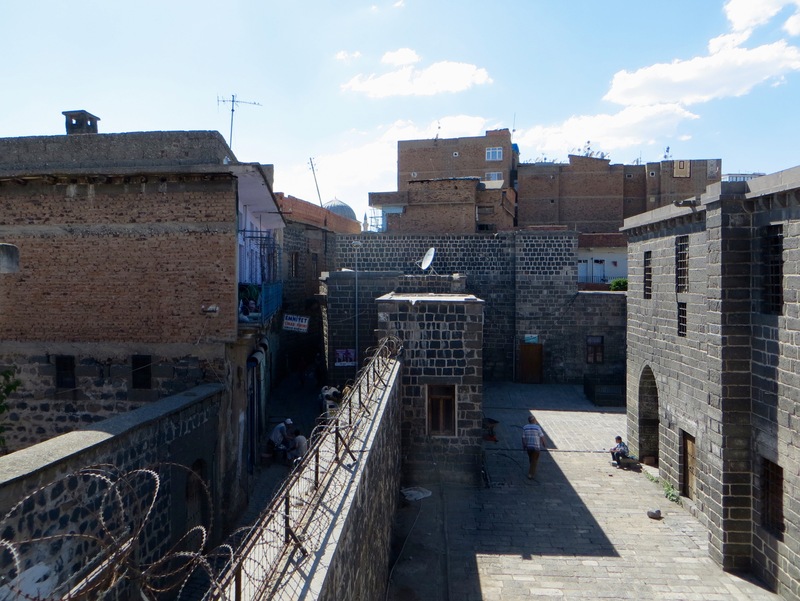 A more liberal air prevails in Diyarbakir than in cities such as Elazig and Erzincan, even though Sunni Islam is the dominant expression of religious faith. 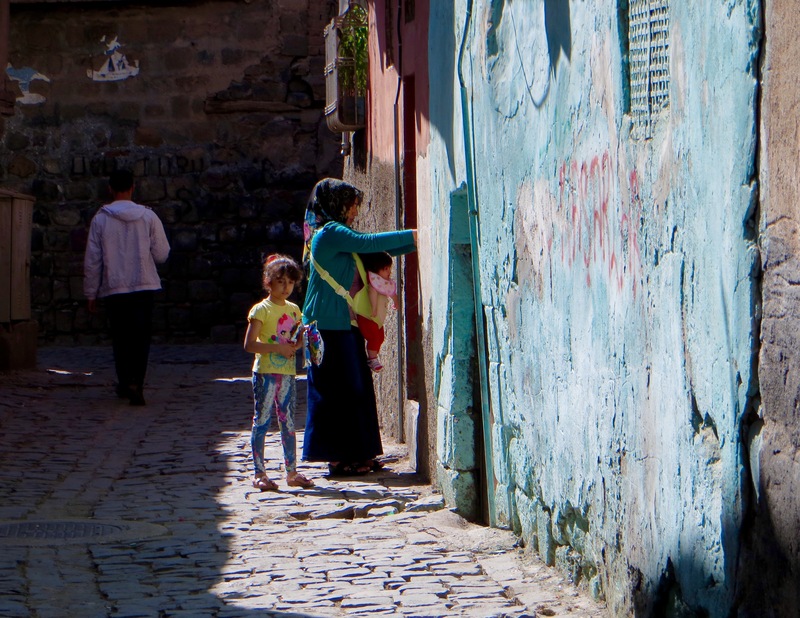 This said, especially in the parts of the old city where some of Diyarbakir’s poorest families live, women are often dressed from head to toe in loose-fitting black garments and they often cover their faces. Older women who do not routinely cover their faces pull their headscarf over their mouth and nose when unknown men come into view. I was reluctant to extract myself from the streets where lots of businesses remained open, people were milling around and there was much to enjoy (however, a lot of police were walking around and armoured motor vehicles had been parked at street corners). I would miss the lifestyle, the opportunities to engage with friendly people, the unusual destinations and the rarely visited monuments, but, in particular, I would miss engaging with some intelligent, forthright and assertive women who confound the stereotypes of women in overwhelmingly Muslim nation states. It was now dark so I returned to the hotel. I arranged everything for the last time in my bags to spread the weight as best I could; read some of Gerard Russell’s “Heirs to Forgotten Kingdoms: journeys into the disappearing religions of the Middle East”, the ideal book for the sort of trip that was about to conclude; showered again; finished the orange juice; and went to reception to pay my bill. I then walked the short distance to the taxi rank where I noted that it cost 20TL to get to the otogar because the otogar is further from the city centre than the airport! The insanity of it all. A growing number of police and armoured motor vehicles had been coming onto the streets as nightfall approached. By 8.00pm helicopters were flying overhead. On the way to the airport armed police officers in cars and armoured vehicles had blocked some roads to traffic or were guarding important intersections. Diyarbakir felt like an occupied city. And the reason for the massive police presence? Ahmet Davutoglu, the Turkish prime minister, was in the city attending a pre-election rally on behalf of the AKP. Because the AKP had become so unpopular in Diyarbakir, an extremely expensive and disruptive police operation had to be undertaken to guarantee his safety. Other than confirming that the AKP was the political party of government and could therefore demand that such a police operation be mounted, it was difficult to imagine what use the rally would serve because the vast majority of Diyarbakir’s population will vote HDP. Still, a few shots of Davutoglu in newspapers the following morning speaking to supports of the AKP in the HDP heartland will be good for AKP morale. The taxi driver could not take me all the way to the terminal. I paid my fare before walking through a temporary barrier staffed by police officers who confirmed that people had a right to access the airport. It was obvious that disruption to normal routines would persist until Davutoglu returned to Ankara by plane later that night. After getting my boarding ticket for the flight to Istanbul and confirming that my big bag would not be seen again until I arrived in Manchester, I settled down in the departure area. My flight was delayed for about an hour because Davutoglu’s movements took priority. I read some more of Russell’s book concentrating on the Yazidis, a community I would have liked very much to have encountered, but would probably have encountered only if allowed access to a refugee camp. A refugee camp 10 to 15 kilometres south of Diyarbakir is said to contain many Yazidis, but, even if I had gone to the camp, I doubt the Turkish authorities would have let me in. During a visit to Midyat two or three ago, I was refused access to a nearby village because the road leading to it went beside a refugee camp. I examined my wallet and found about 60TL. The Turkish lira was slowly dropping in value against major world currencies and the trend was likely to persist for at least a few months, so keeping the liras was unwise. Turkish and Kurdish passengers were enthusiastically buying boxes of baklava from the airport’s branch of Saim, one of Diyarbakir’s best sweet manufacturers, so baklava seemed the obvious thing to buy. I asked for half kilos of two varieties to fill a kilo box, but was not given the sweets until I had had one to eat. It tasted excellent and, back home, Hilary and I agreed that it was some of the best baklava we had ever consumed. I looked around at my fellow passengers and noticed something that had been confirmed earlier during the trip: more Turks and Kurds are overweight now than ever before. A product of growing prosperity and a more sedentary lifestyle, excessive weight has led to an interest among the better-off in jogging, gyms, organic food and experiments with celebrity-endorsed diets. Men are more prone to being overweight than women, and young women, whether pious or not, are the people least likely to have weight problems. In fact, some young women are painfully thin. I, in common with many others, blame this problem on the adverts and photos of actors, models and other celebrities with ludicrously slim bodies which inspire in young women wholly unrealistic images of what constitutes desirability in appearance. P.S. 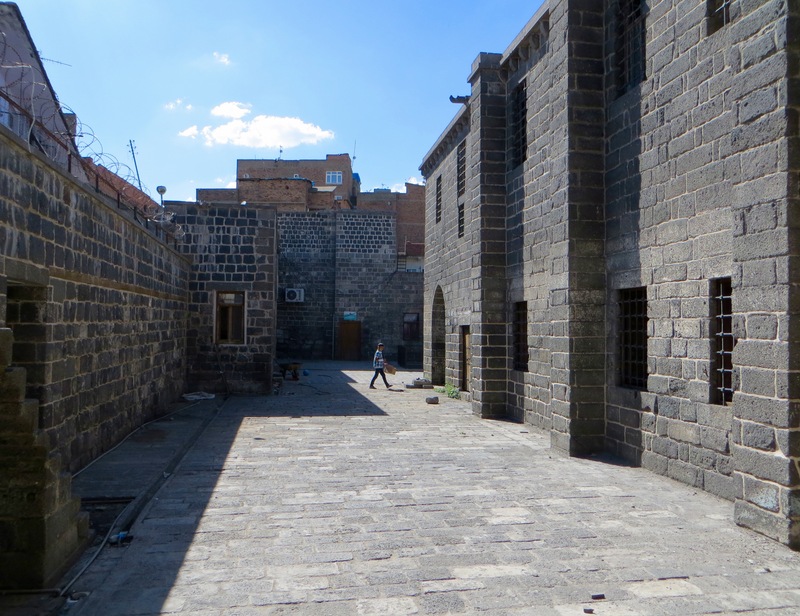 Partly because Diyarbakir had such a large Armenian population at the time, and partly because even more Armenians lived in the surrounding towns and villages, Diyarbakir became one of the cities where the number of Armenians murdered in 1915 and thereafter was the largest during the genocide. 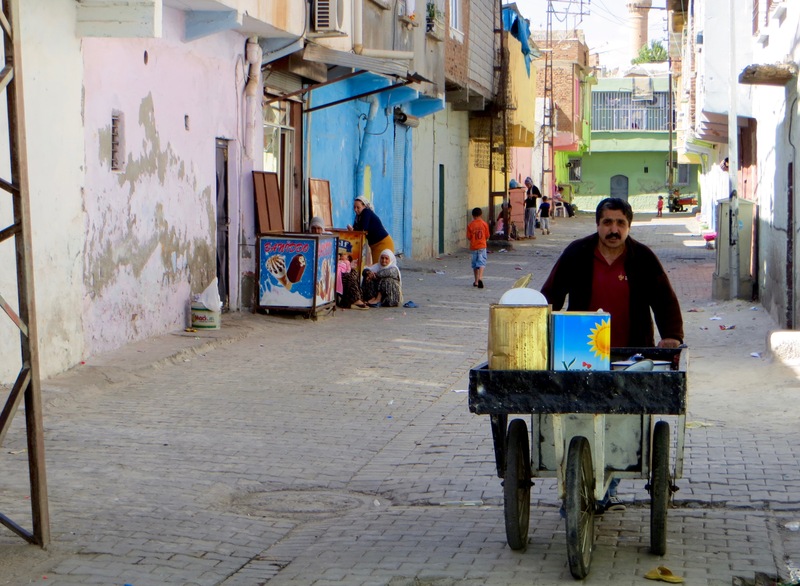 Christopher Walker describes Diyarbakir at the time as “an inferno of torture and murder”. In 2006, David Gaunt estimated that almost 70,000 Armenians met their deaths in Diyarbakir province and only 3,000 of the province’s Armenians remained alive after world war one. Some scholars put the figure for Armenians murdered in Diyarbakir province even higher than this. 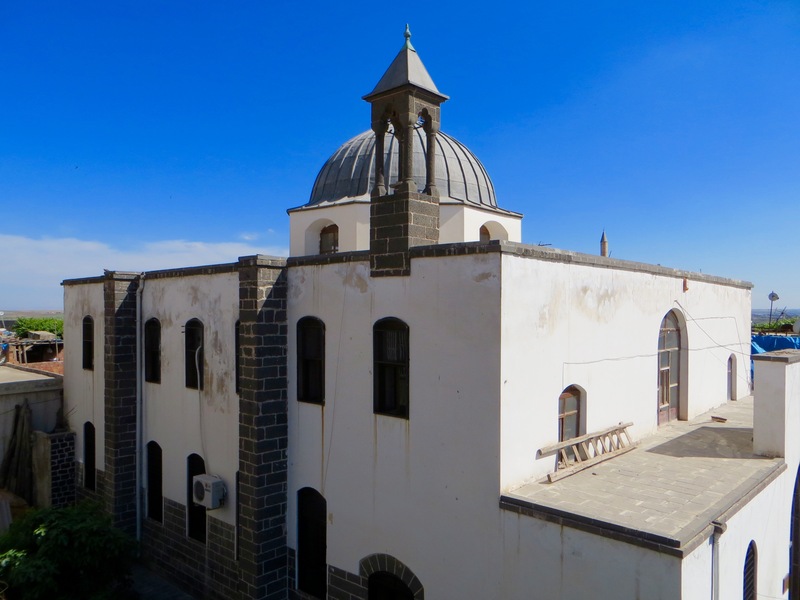 The Syriac Orthodox Church of the Virgin, Diyarbakir. I resumed my walk through the neglected streets of the old city before coming across a cultural centre arranged around a large courtyard. The cultural centre had once been a large house and must have been built by a wealthy family. An elderly man with a large salt and pepper moustache invited me into the courtyard. About forty males and females sat on chairs facing six elderly men, and one of the elderly men recited from memory what I soon understood to be an epic from the distant past important to the Kurdish people. 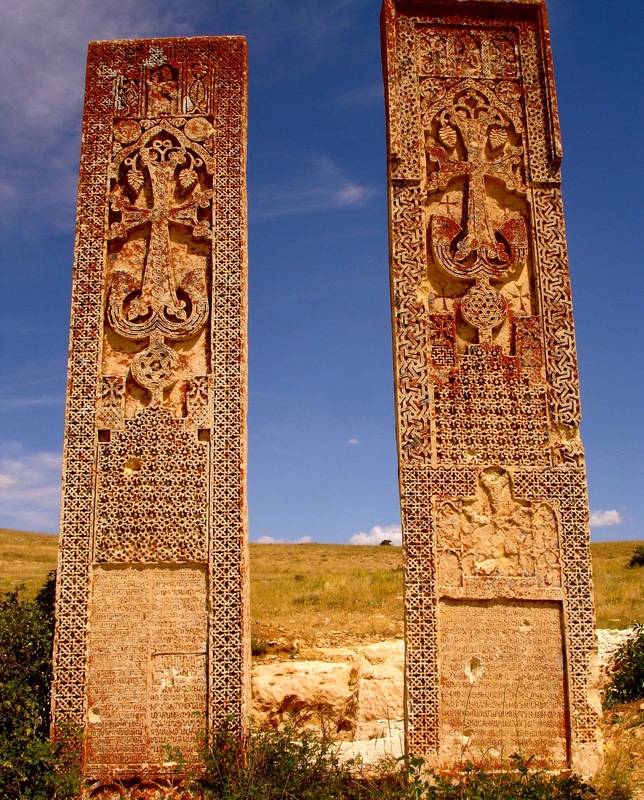 The story was told in Kurmanji, which, until a few years ago, would have been an unlawful act. It is only for the last few years that Kurds have been allowed to give public expression to their cultural identity through the use of Kurmanji. I stayed until the end of the recital, which concluded with rhythmic clapping by everyone present. 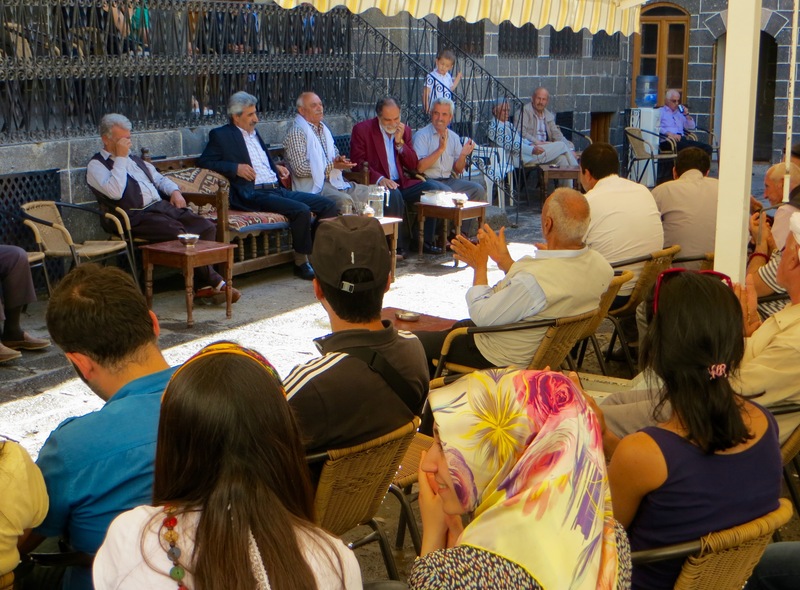 After I had thanked the man who had invited me into the courtyard and the man responsible for the recital itself – the latter was delighted that the audience had responded so positively to his admirable efforts – I chatted with four young women, at least three of whom were Kurdish. All four were university students. 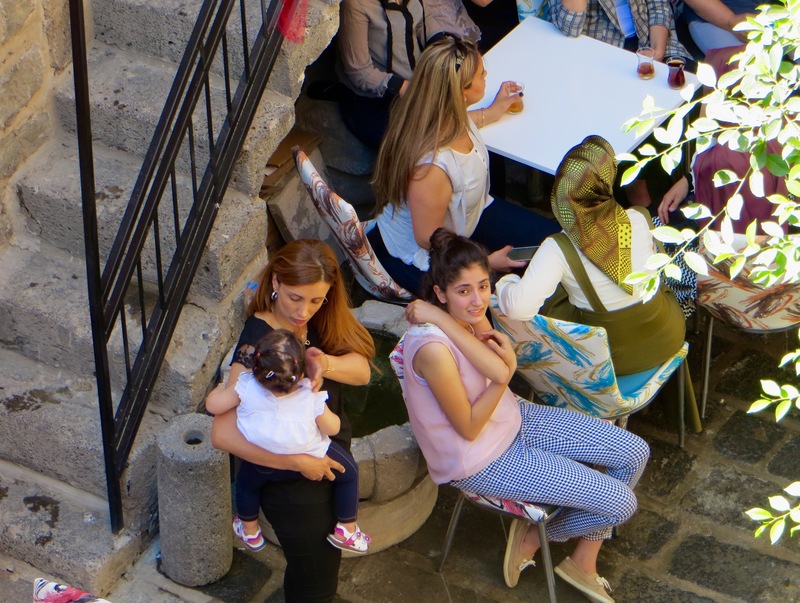 Three of the women, all from Diyarbakir itself, did not wear headscarves. Two wore jeans and casual tops and the third a long skirt and a t-shirt. One of the three women without a headscarf – she was training to be a teacher – had a top that revealed her arms and more of her chest than most women in Turkey would risk doing. She was the most extrovert and self-confident of the four and, when I said I was a teacher and part-time university lecturer, she interrogated me about educational matters. 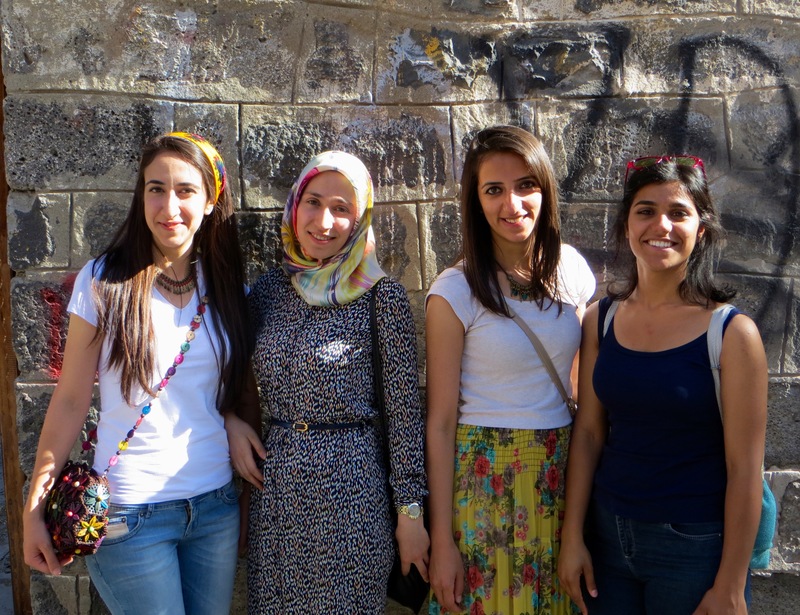 The fourth woman in the group was from Adiyaman and was spending a few days with her friends in Diyarbakir. She dressed as a conventionally pious young Sunni woman revealing nothing of her body except her hands and face. She may have been Turkish rather than Kurdish. I was asked what I intended to do and said, “I will walk to the Syriac Orthodox church to see how things are. I have not visited the church for a few years.” The young women had some spare time and, to my amazement, decided to come as well. It turned out that none of them had been to the church before. As we meandered toward the church, we chatted about the forthcoming election. 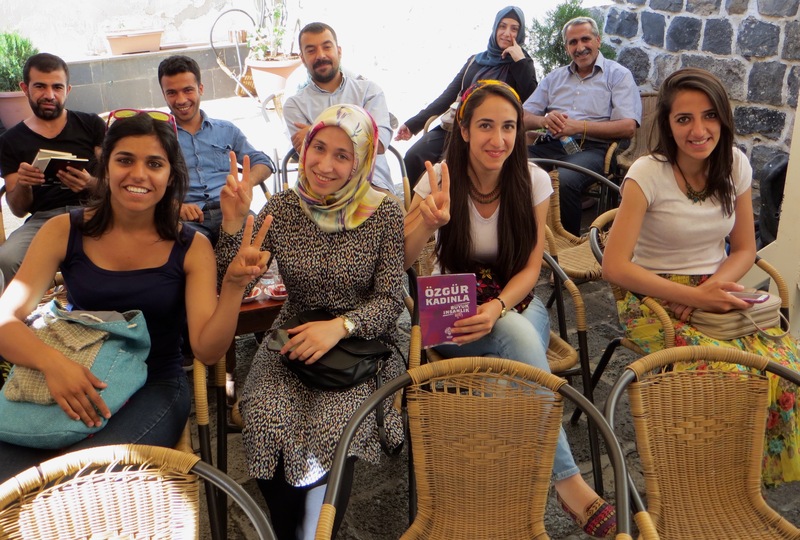 The women living in Diyarbakir intended to vote for the HDP. She did not say how she would vote, but I suspected that the woman from Adiyaman would vote for the AKP. In some respects the barriers are indicators of optimism now that peace prevails in Diyarbakir and the rest of south-east Turkey. The Belediye now helps to look after the church (hence the barriers and a uniformed attendant) and the church is firmly on the city’s rapidly expanding tourist trail. 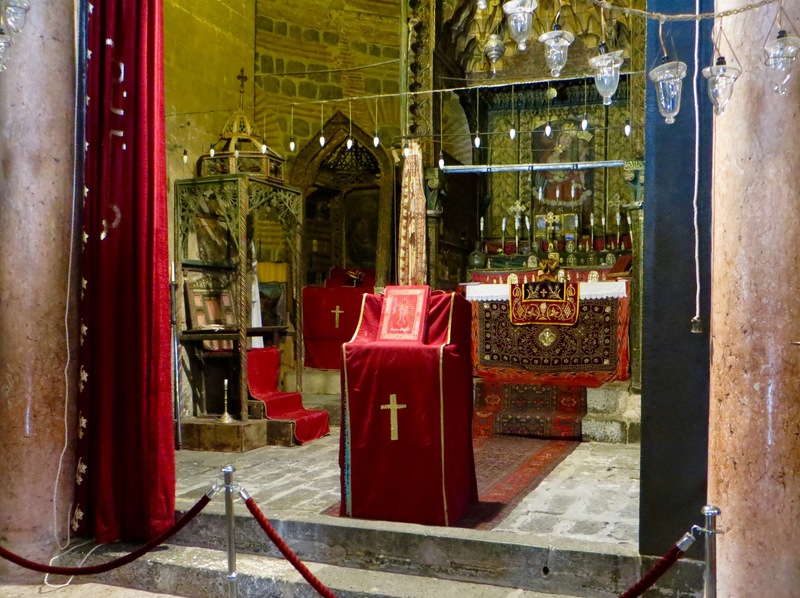 Inside were some tourists, Turkish and as well as foreign, and about thirty Syriac Christians. The Syriac Christians had stayed following the end of mass earlier in the day. Among the milling people was Abouna (Father) Yusuf Akbulut, whom I had first met in 2009. Yusuf was very busy, but we managed to briefly chat. I was amazed that he recalled the visit I had made with Hilary one rainy day in October almost six years earlier. 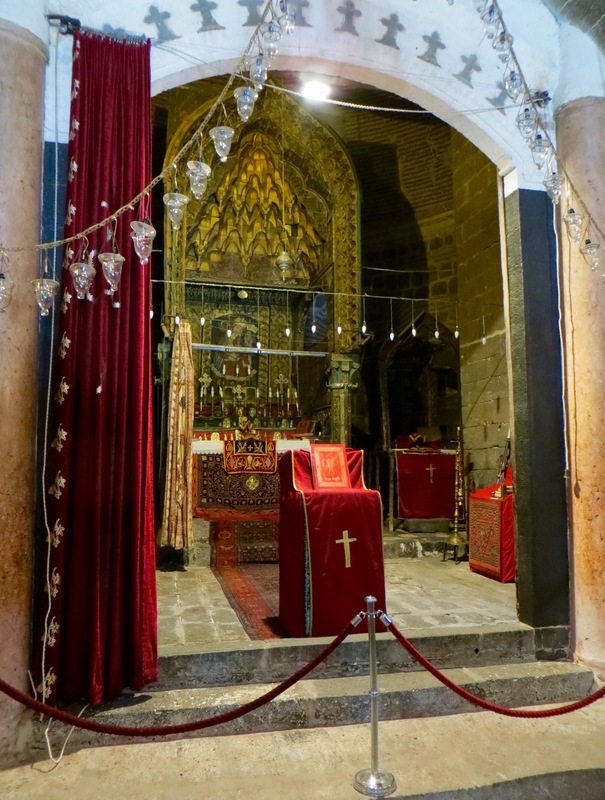 The Syriac Orthodox Church of the Virgin. The nave is now domed: the eight supporting piers, two set against each of the n. and s. walls, shoulder arches and pendentives. Beneath the original capitals in the e. wall doors lead to chambers either side of the apse, but these chambers are late. The n. door’s heavy, rectangular external frame was probably part of the original church. 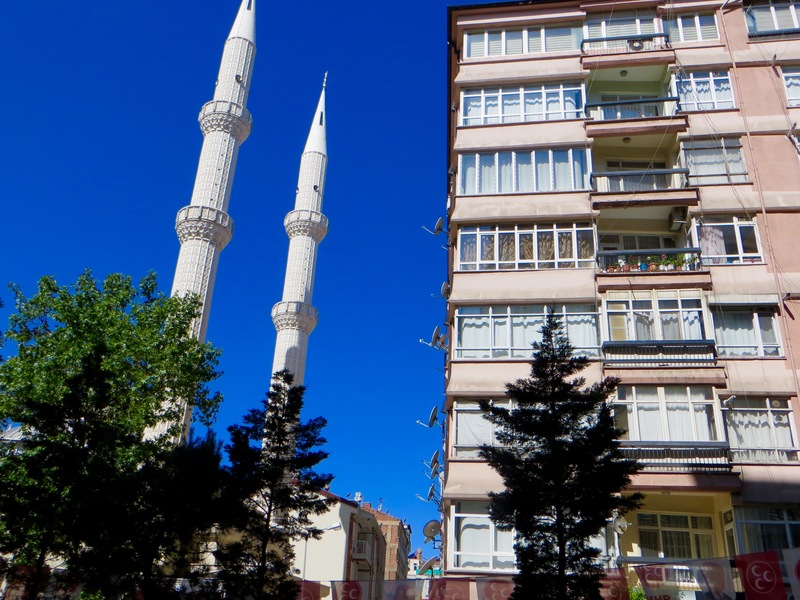 I was returning to Gazi Caddesi when, along Muallak Sokak in the south of the old city, I came across two more churches very close to one another. The entrance to the first of the two churches was open and an elderly Kurdish man kindly took the time to show me around. 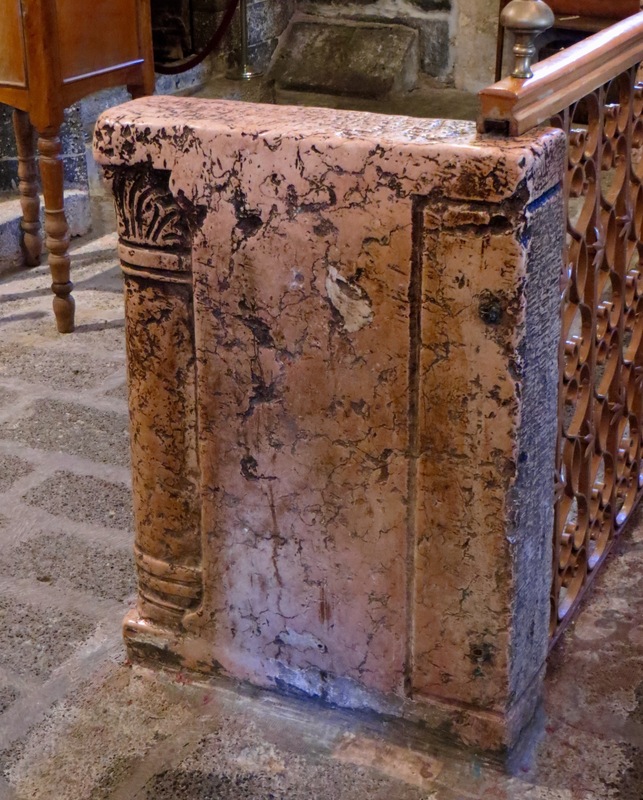 We very quickly established that it had been Armenian (a lot of stone has Armenian script carved into it) and that it has survived, albeit in a state crying out for tender loving care, because one of the buildings around the courtyard is used as a nursery. I could not enter the church itself because the doors were locked, but it and the other buildings comprising the complex are in far better condition than Surp Giragos was in the late 1980s. In other words, it would be far easier and less costly to restore the Armenian church on Muallak Sokak than Surp Giragos itself. Back home, the only information I could find about the church is that it had once belonged to the Armenian Catholics. The Armenian Catholic Church is one of the Eastern Catholic churches of the Roman Catholic Church. The Church accepts the leadership of the pope in Rome and is therefore in full communion with the other Eastern Rite, Oriental Rite and Latin Rite Catholics. The Armenian Catholic Church is regulated by Eastern canon law. The head of the Armenian Catholic Church is the patriarch of Cilicia and the Church’s main cathedral is that of St. Elie and St. Gregory the Illuminator in Beirut in Lebanon. 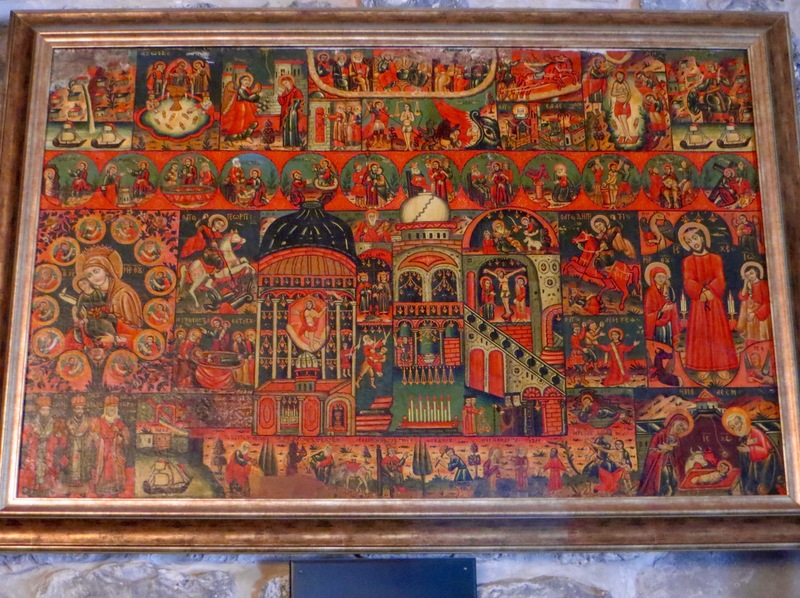 After the Armenian Apostolic Church formally broke from the Chalcedonian churches in the 5th century, some Armenian bishops and congregations attempted to restore communion with the Roman Catholic Church. 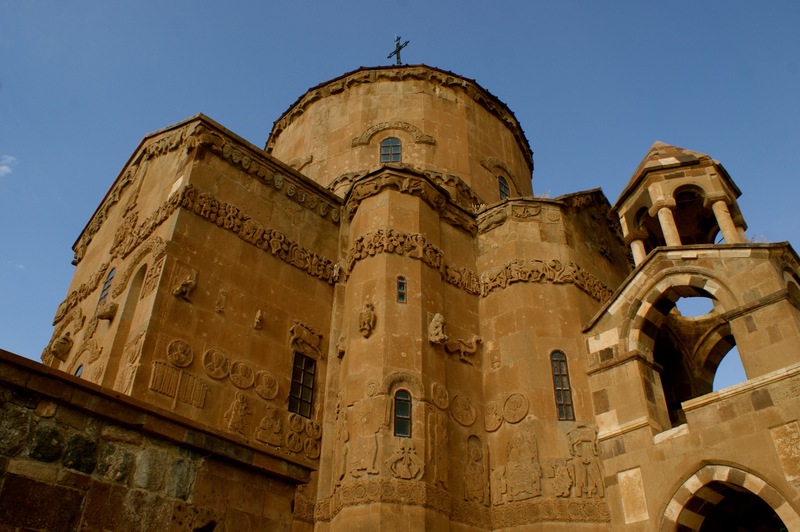 During the crusades, the church of the Armenian kingdom of Cilicia entered into a union with the Roman Catholic Church, but this proved a union that did not last. The union was later re-established during the Council of Florence in 1439, but did not have any real effects for centuries. In 1740, Abraham-Pierre I Ardzivian, who had earlier become a Roman Catholic, was elected as the patriarch of Sis. 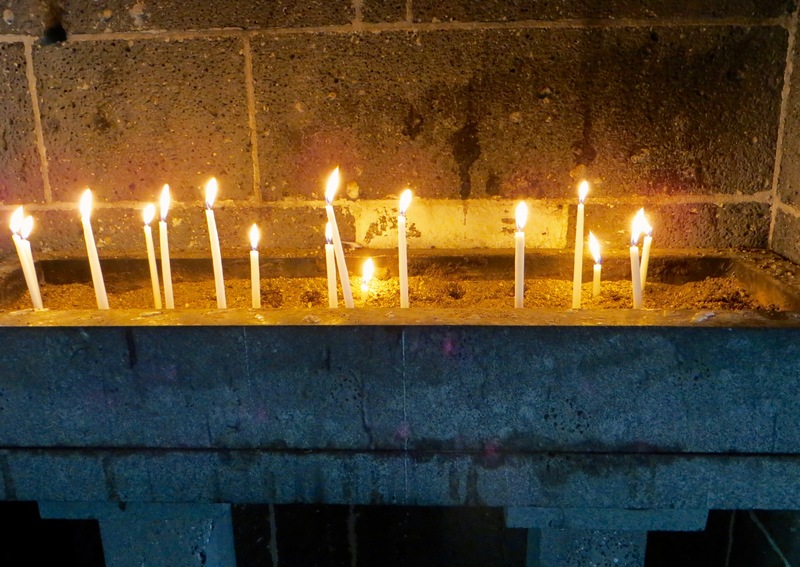 Two years later Pope Benedict XIV formally established the Armenian Catholic Church. 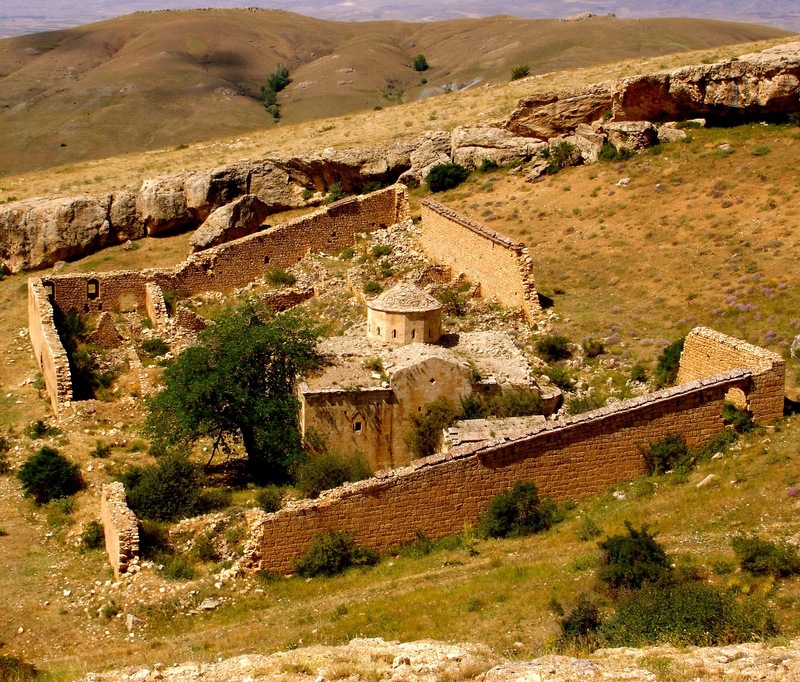 In 1749, the Armenian Catholic Church built a convent in Bzoummar in Lebanon. During the genocide, the Church in Anatolia almost completely disappeared, but it survived in Lebanon and Syria. An Armenian Catholic community was also formed by Armenians living in Poland in the 1630s. The community, which had been most numerous in Galicia and the pre-1939 Polish borderlands to the east, was expelled after world war two to present-day Poland and now has three parishes in Gdansk, Gliwice and Warsaw. The Church uses the Armenian rite and the Armenian language in its liturgy. The Armenian rite is also used by the Armenian Apostolic Church and a significant number of Eastern Catholic Christians in Georgia. The rite is shaped by the directives of St. Gregory the Illuminator, founder and patron saint of the Armenian Apostolic Church. 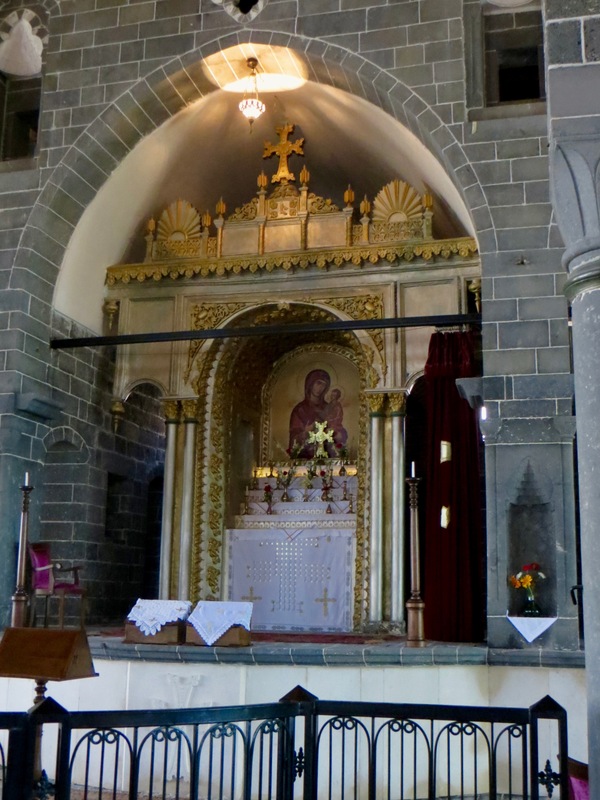 Unlike the Byzantine Church, churches using the Armenian rite are usually devoid of icons and have a curtain concealing the priest and the altar from the people during parts of the liturgy. The use of a bishop’s mitre and unleavened bread are reminiscent of the influence Western missionaries once had on both the miaphysite Apostolic Armenians and the Armenian rite Roman Catholics. 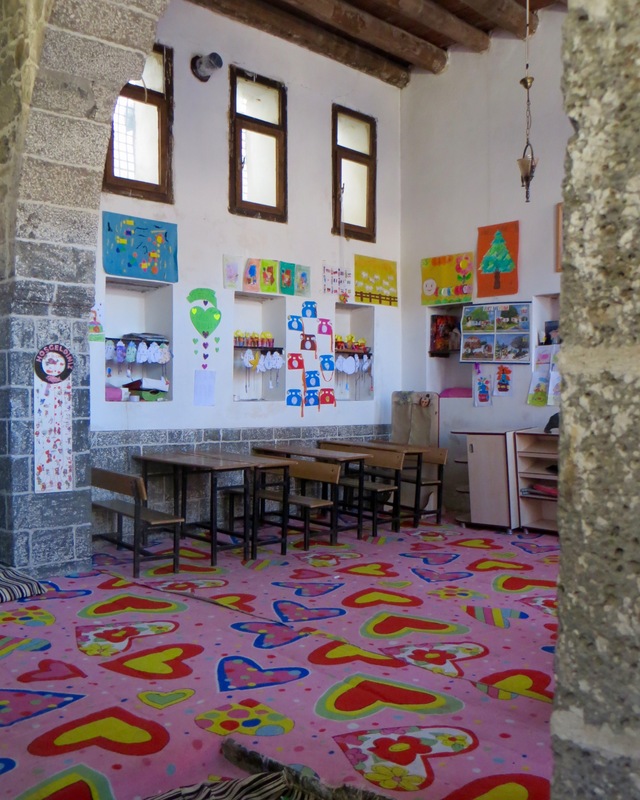 The nursery, the Armenian Catholic church. 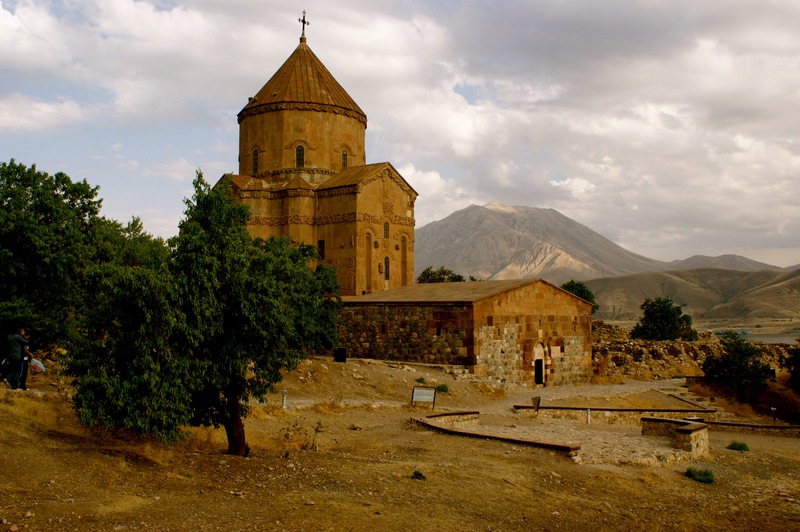 Although members of the Armenian Apostolic Church are far more numerous than Armenian Catholics, it is alleged that about one million Armenians belong to the Catholic Church. 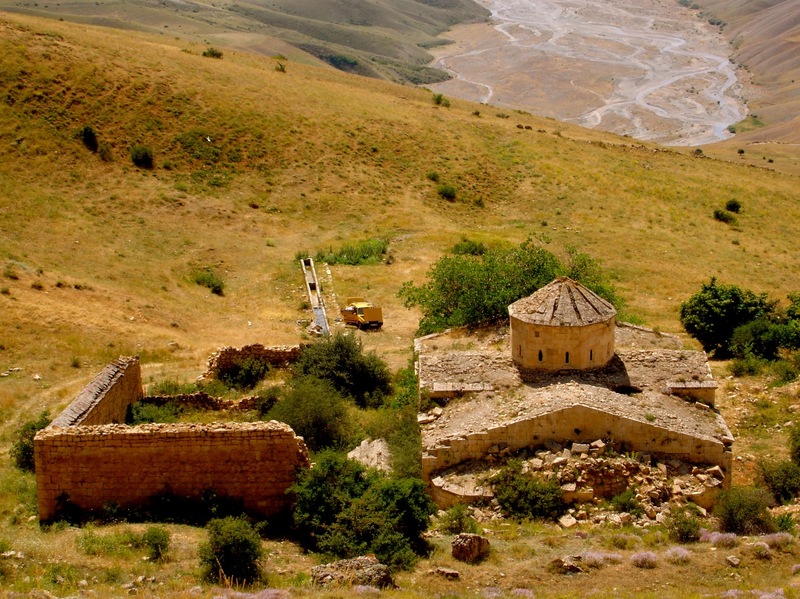 In 2008, about 3,500 Turkish Armenians were thought to be Catholics. Most such Armenians live in Istanbul. 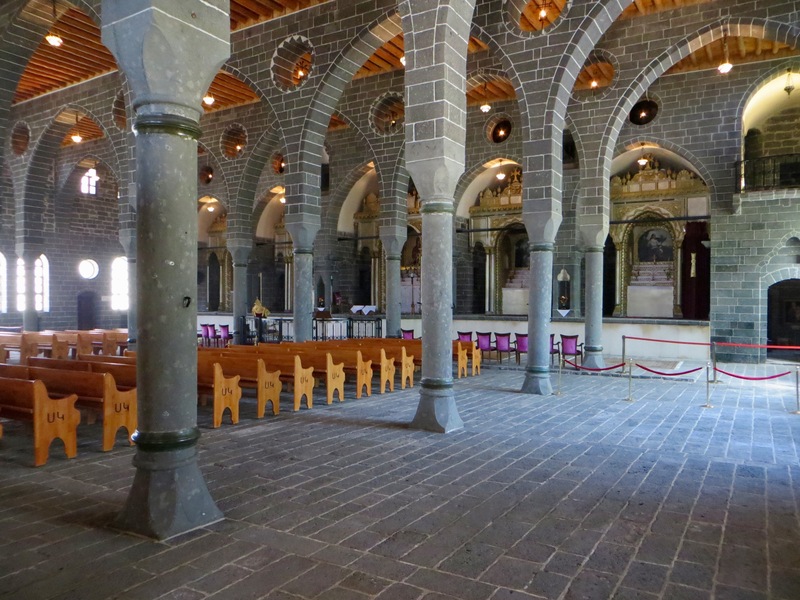 The official website of the Armenian Catholics mentions twelve churches in Istanbul and one in Mardin, but, sadly, nothing about the abandoned church in Diyarbakir. There has been a strong movement in recent and not-so-recent times among the Eastern Catholic churches favouring conformity with Roman Catholicism in the matter of celibacy. For example, the Armenian Catholic Church dependent upon the patriarch of Cilicia, even as far back as July 1869, passed a resolution that celibacy should be required of all the higher orders of the clergy. Similarly, the 1888 Synod of Scharfa in Syria decreed that “the celibate life, which is already observed by the great majority of the priests of our Church, should henceforth be common to all”, although the deacons and priests who were already married were allowed to continue as before, and a certain power of dispensation in cases of necessity remained with the patriarch. 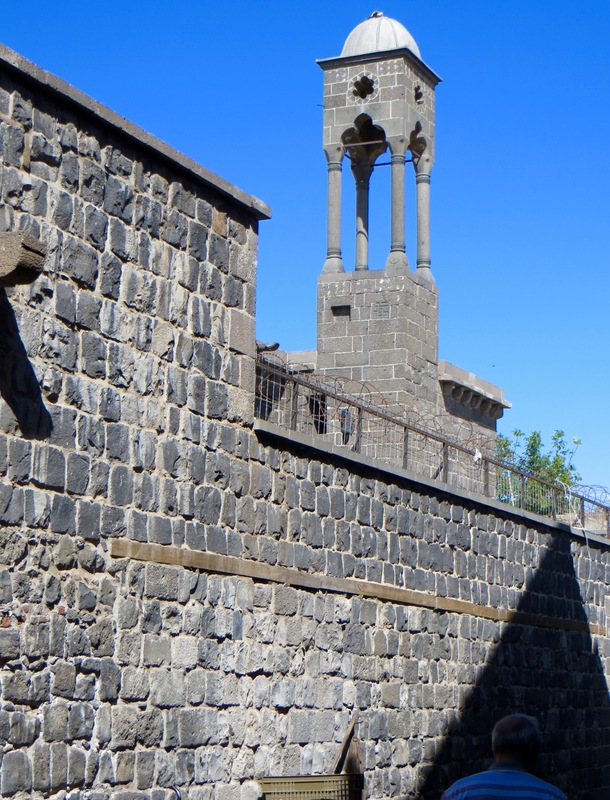 Surrounded by a high wall and barbed wire, the church is the Armenian Protestant Church of Surp Pirgic (Holy Saviour). It was built in 1870 (the Armenian Protestant Church is a relatively recent offshoot of the Armenian Apostolic Church) and was probably in use until the terrible events of world war one which led to the expulsion and murder of the local Armenian population. It remained derelict thereafter, but in 1983 was seized by the authorities. 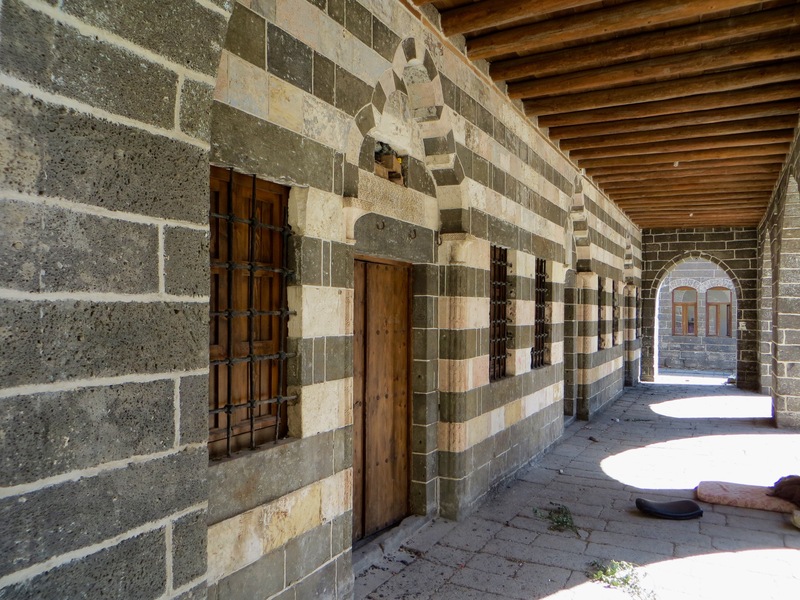 In 2010 it was restored and turned into a carpet weaving training centre, but the Armenian Protestant diaspora has begun the legal process of reclaiming it and returning it to a functioning place of worship. 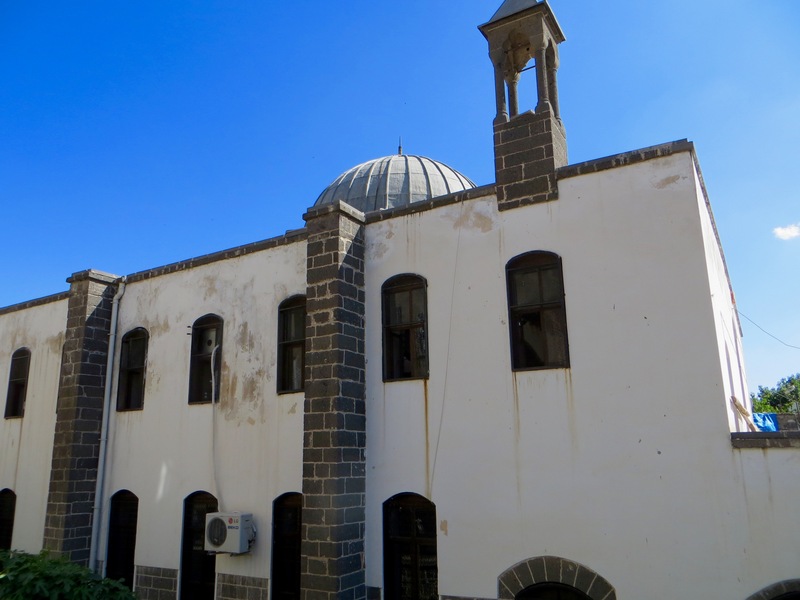 What can be said is that a relatively new Protestant church opened a few years ago opposite the city’s Syriac Orthodox church, thereby confirming that Diyarbakir has a Protestant community, although not one that currently uses the city’s older Armenian Protestant church. 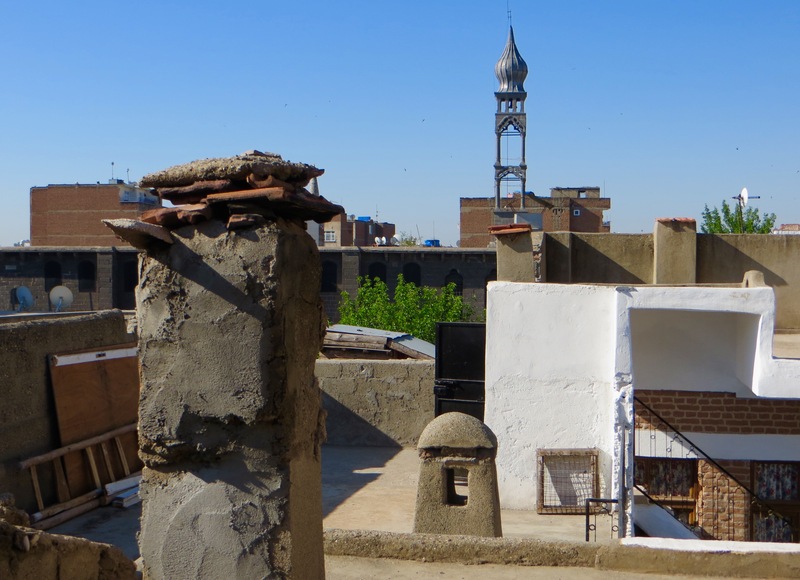 Both churches along Muallak Sokak looked to me as if what survives today largely dates from the 19th century, but it would not surprise me if the Armenian Catholic church has parts that are considerably older. An article on the internet about Turkey’s Protestant community suggests that there may be 50,000 altogether, but most Protestants are expatriates from Europe and North America living in Turkey permanently or temporarily. 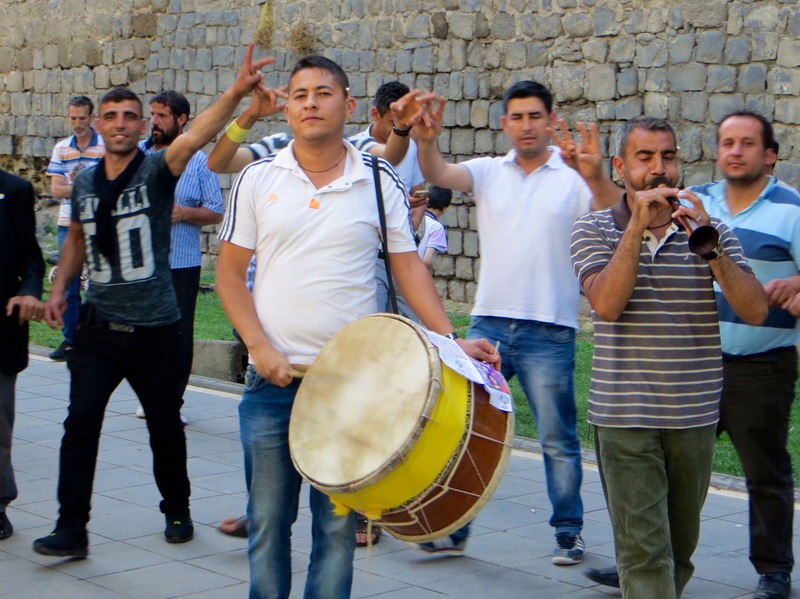 Only about 5,000 Protestants are indigenous Turkish citizens, of whom about 4,000 are converts from Islam and a thousand are converts from Christian churches including the Armenian Apostolic Church. To get a better view of the Protestant church, I entered the courtyard of a nearby café and lokanta (it was very similar in design and layout to the Aslihan Antik Pansiyon, Café ve Restorant) to climb steps to look over the wall topped with barbed wire. I found myself surrounded by a large group of Kurds celebrating the marriage of a young couple. A majority of the Kurds present, whether young or old, were secular in inclination, which meant that the atmosphere was delightfully boisterous and the sexes could mix. After brief chats with a few of the people present, the owner of the café and lokanta ushered me up some stone steps to a sort of kiosk at first floor level from where I had an uninterrupted view of the dome and the bell tower of the church. 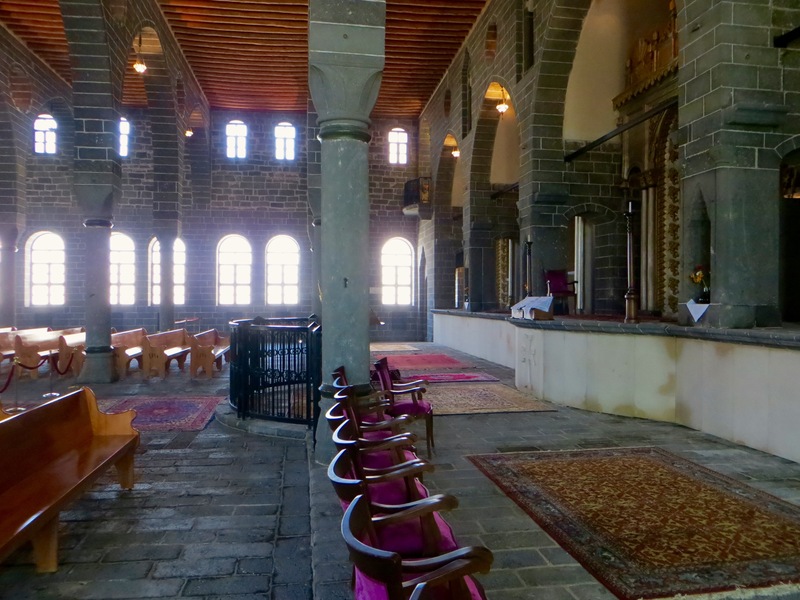 Surp Giragos Armenian Church, Diyarbakir. Surp Giragos was very busy, as you might expect because it was Sunday, but, because the morning service had concluded an hour or two before my arrival, it was primarily busy with people eating large meals in the courtyard (although every now and again small groups of Armenians or Kurds entered the still-open church to look around). Most of those eating appeared to be Kurds, but in a smaller courtyard to the north of the church about forty Armenians (foreign-born? A bus group from Istanbul?) were finishing a meal with two or three priests of the Apostolic Church. 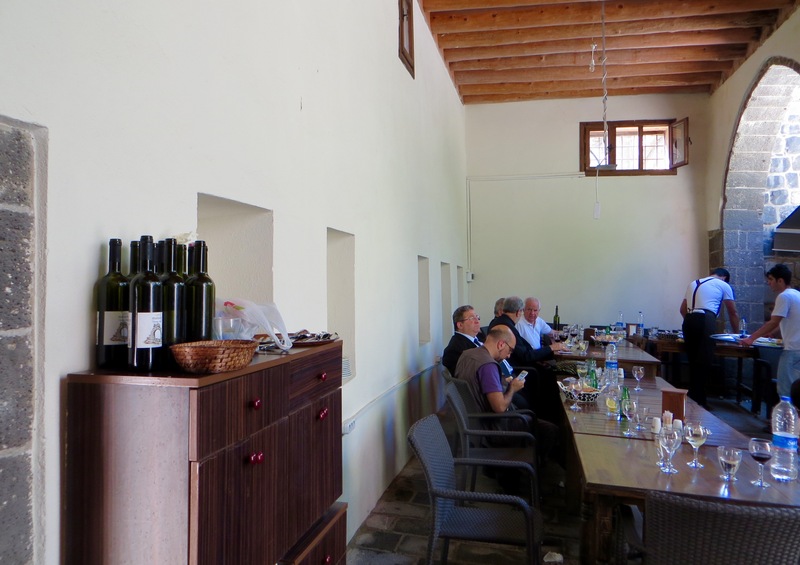 The joyful atmosphere was enhanced because the adults had consumed at least a dozen bottles of red wine made by the Syriac Orthodox Christians of Tur Abdin. 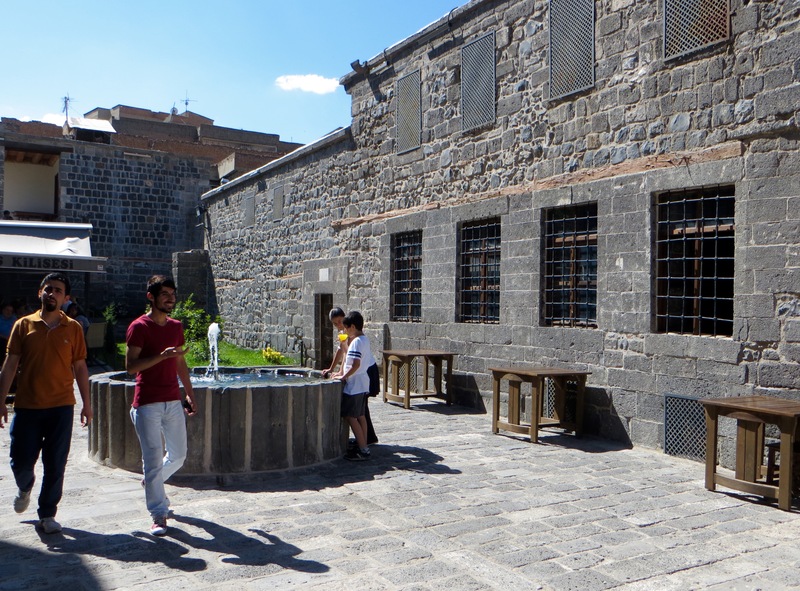 I chatted with a few Armenians who had finished their meal, and with a young Armenian woman responsible for some of the informative displays that enlighten visitors about the church in particular and Diyarbakir’s once-substantial Armenian population in general. It was wonderful to be back and to see the church so popular with Armenians and local Kurds. 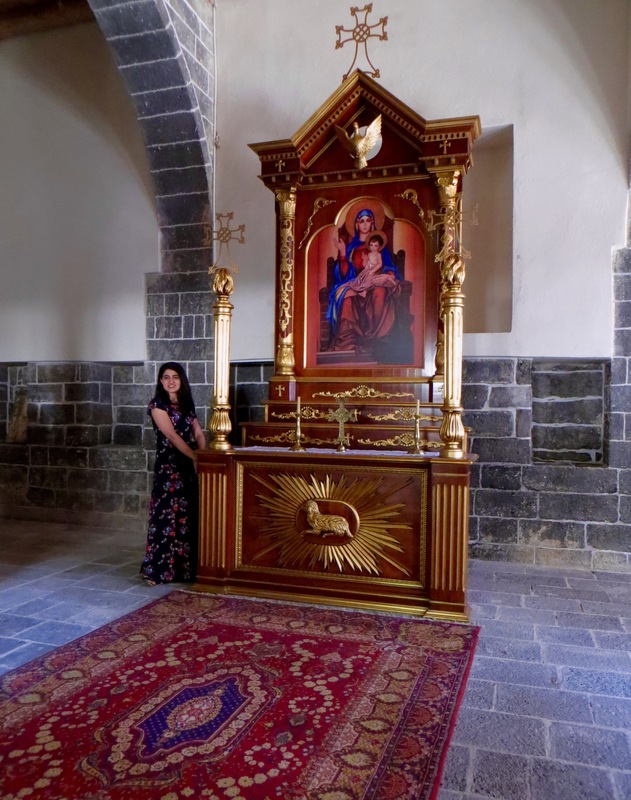 The church that has been so carefully restored (it was badly damaged in the 1915 genocide, but restored in the 1960s when about a thousand Armenians still lived in the city and its immediate surroundings. 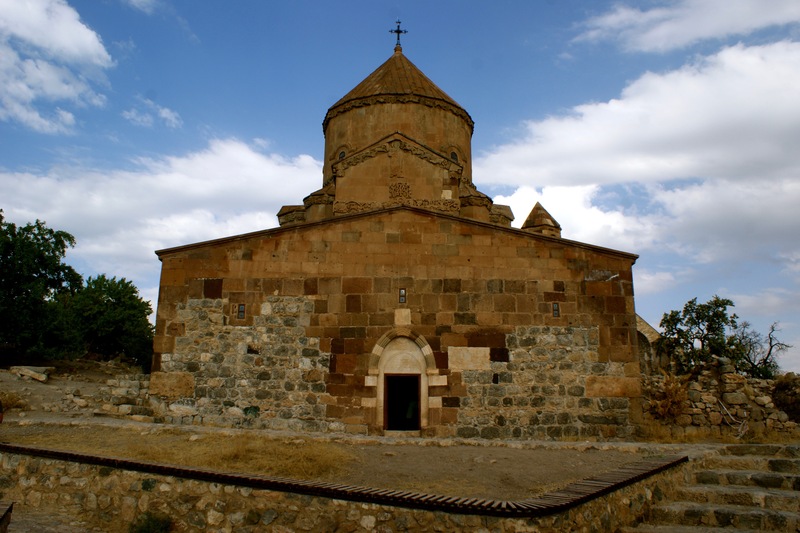 However, as Armenians left the city in the years that followed, the church had to close. 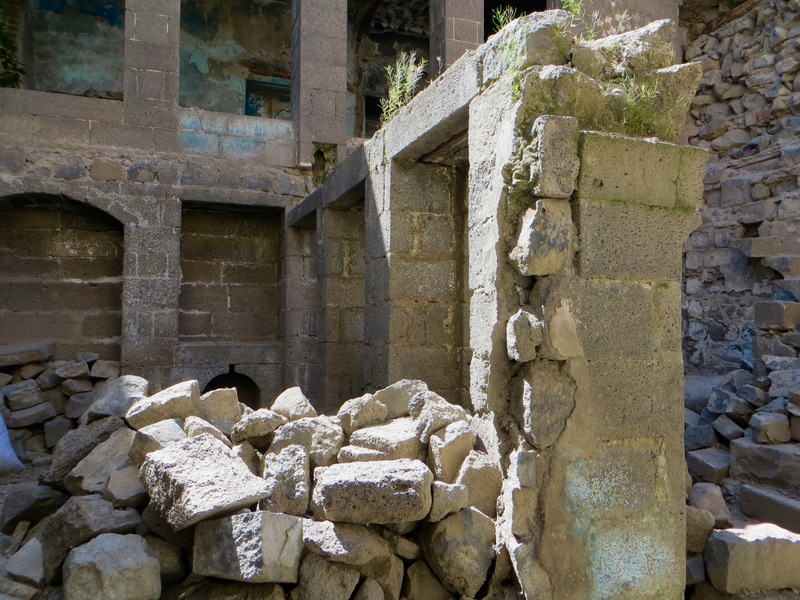 It was a ruin once again by the mid-1980s) dates from the first half of the 19th century, but Armenian sources suggest an Armenian church has been on the site of Surp Giragos since the 15th century. The complex is unusual in that it has no fewer than seven altars (five are in the church alone). Enclosing the church are buildings that once accommodated a school, chapels, storage space and living quarters for priests. Sinclair refers to a baptistery, and says that the raised gallery at the west end of the church’s nave is where women used to worship separately from men, but nowadays men and women worship together in the nave among the columns supporting the roof. One of the altars is in a room separate from the church itself and is dominated by a picture of Mary with the infant Jesus. An attractive rug covers the stone floor in front of the altar. Nearby is an ornately carved wooden chair painted gold; the upholstery is ruby-coloured. 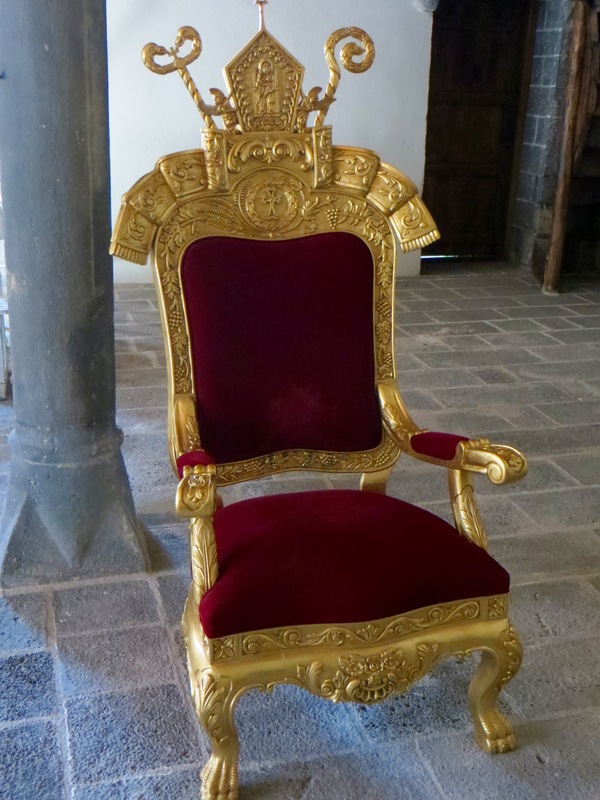 The chair looks very much like a throne for a bishop or the Patriarch of Constantinople/ Istanbul himself. One of the most notable features of the church is the slim bell tower that rises above the entrance. Pictures of the church dating from the 19th century suggest that the church once had a bell tower taller than the one today, and the taller bell tower appears to be what existed at the time of the genocide itself. View of the bell tower, Surp Giragos Armenian Church. 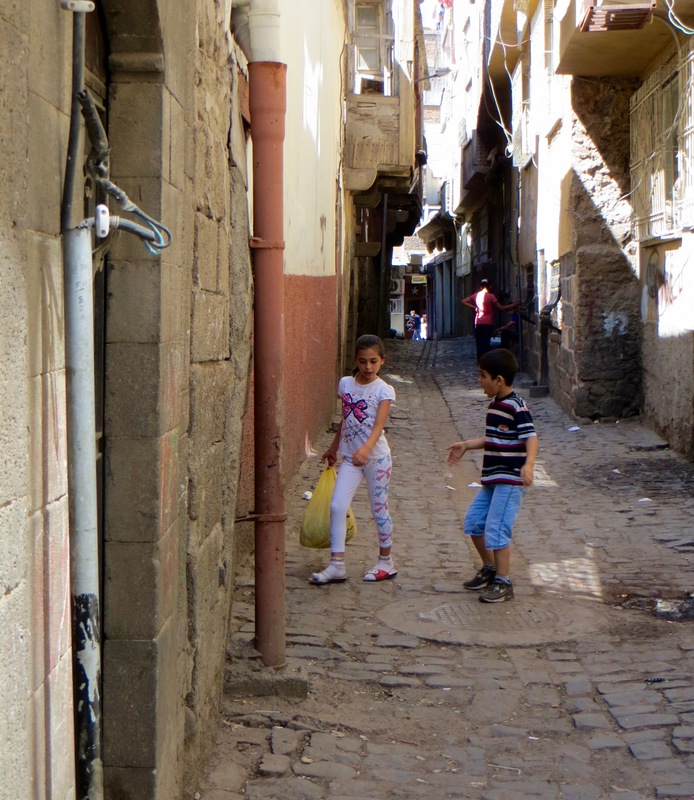 Next, I walked east of the church to part of the old city where some of Diyarbakir’s poorest families live. Most men were at work, despite it being a Sunday, or with friends in tea houses or barber’s shops, so the residential streets were dominated by women and children. In many parts of the old city buildings private, religious or civil have been constructed with the same dark-coloured stone found in the walls and gates that encircle the district, but along the streets where I walked most old structures have been replaced by houses and small apartment blocks made with breeze blocks covered with plaster. As a consequence, the walls are painted many eye-catching colours that look their best in the late afternoon sunshine. It proved a wonderful time to be walking around. The Mayd Hotel has two female staff, one who cleans the rooms and gets them ready for guests, and one who prepares breakfast and light snacks during the day. Both women, one of whom wears a headscarf, like to smoke and are occasionally encountered sucking on cigarettes on balconies or in empty bedrooms. They work harder than the males in the hotel, the owner himself and his four other employees. The latter share duties on reception, carry guests’ bags to their rooms, assume responsibility for the laundry and undertake odd jobs to ensure the smooth running of the hotel. It was the last breakfast of the trip so I went for broke. I had honey with yoghurt, borek, fried potatoes, grilled peppers, four types of olive, two types of cheese, tomatoes, boiled egg, simit, cherry jam, strawberry jam, melon, tea and water. I wanted to delay leaving the hotel for as long as I could so I had less time to spend in Diyarbakir, from where my flight was not scheduled to depart until just after midnight. 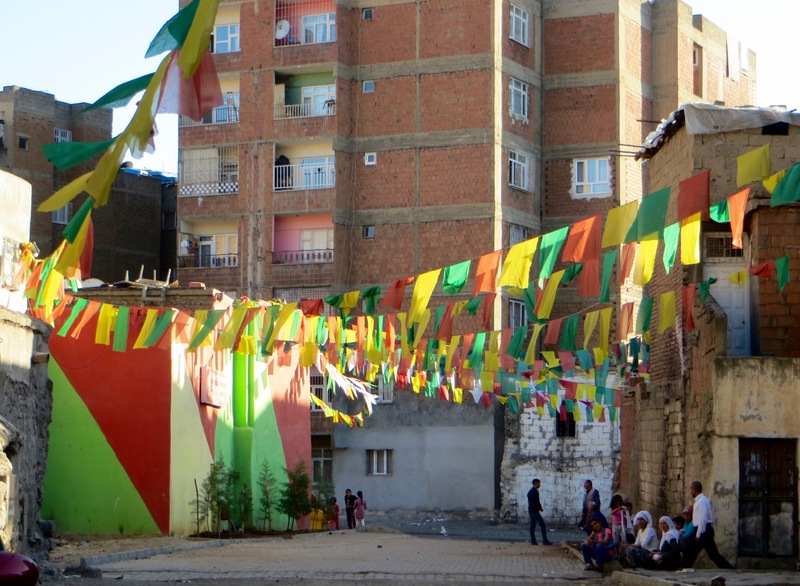 I went for a walk, calling first at the main square to examine for the last time the brightly painted buildings surrounding it and the bunting hung by the different political parties. A block south of Gazi Caddesi is the street emerging as the place for up-market consumer goods including clothes, so I went there next to confirm that it aspires to be Elazig’s miniature version of Kensington or Knightsbridge in London. It does have aspirations to emulate Kensington or Knightsbridge, and every so often I passed a new or yet-to-be-completed office or apartment block manifesting enviable attention to detail to make it look attractive. The more I walked around, the more the area looked as if it would emerge as an inner city middle class enclave where the devout and the secular live together, but still somehow exist in parallel universes that never quite connect or interact. After walking past a small park sheltered by mature trees, I arrived at a sterile open space where buses arrive and depart for destinations around the city. I then entered what is overwhelmingly a residential area north of Gazi Caddesi, but small business premises exist in most of the apartment blocks at street level. I zig-zagged north and east until arriving at a wide street running north to south where a narrow ribbon of greenery and a dry water feature turned the road into a dual carriageway. An attractive modern mosque overlooks the road from the west. In a shop window on the east side of the street two women were making gozleme. The older woman had used a scarf to cover her face except her eyes and the top of her nose, but the younger woman used her scarf to cover only her hair and ears. I wanted to take a photo of the two of them sitting on the floor as they rolled out the dough before cooking the gozleme on convex circles of sheet metal over a wooden fire, but could tell that they were reluctant to be thus immortalised, even though a man in the shop urged them to let me do so. I was on the Sunni side of the street and did not want to cause the women any embarrassment. But here, once again, is hypocrisy writ large. Females from about the age of fourteen or fifteen are discouraged from having photos taken of them by anyone other than relatives or close family friends, but males of all ages urge you to take photos of them all the time, even if you have only just met them. When photography first became popular in Muslim societies, males and females were reluctant to be photographed because the rumour spread that the photograph somehow captured part of a person’s soul and that the part of the soul thus captured would never return to the body which once possessed it. In time, however, males overcame their fear that part of their soul would be lost for all eternity and allowed themselves to be photographed with ever greater enthusiasm. But females were still discouraged from being photographed, partly because of the ludicrous idea about the “theft” of part of the soul, but also because males did not want female family members to be looked at in photos by people who might have lustful inclinations toward them! That photos might be taken of Muslim males by photographers who had lustful inclinations toward them did not seem to count, of course. As ever, therefore, females were required to inhabit the background while males got to strut their stuff. I returned to the hotel to arrange things in my bags in such a way as to ensure the weight was as evenly distributed as possible, then showered, ate a peach given to me in Solhan, drank lots of water chilled in the bedroom fridge and went to reception to settle the bill. 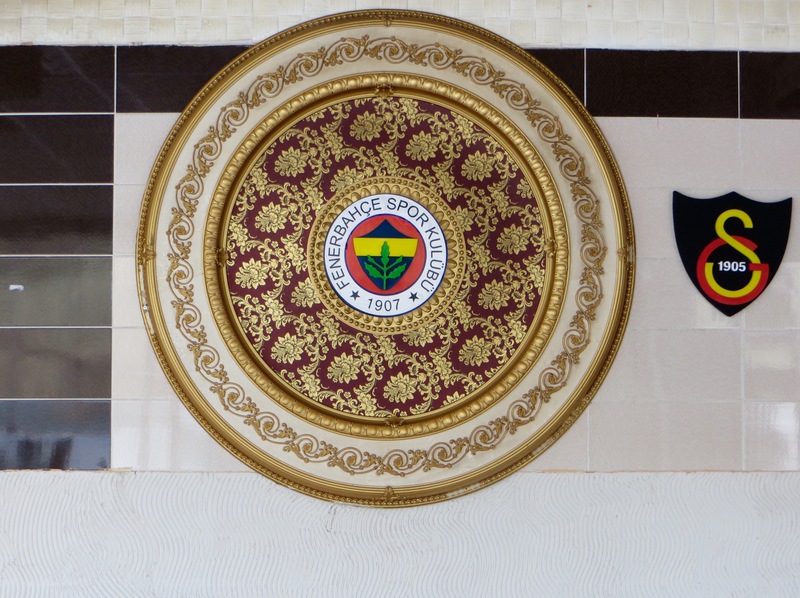 It was about 10.40am when I left the hotel and I arrived at the minibus garaj just in time to catch the 11.00am departure for Diyarbakir. I could not recall the hills and mountains south of Elazig ever looking so pretty or so tempting to walk through. The visibility was excellent, so much so that my last day in Turkey was very good for photography, even though I was going south into less elevated surroundings on the last day of May when temperatures were definitely warmer than when I started the trip. There were just enough white clouds to render the sky interesting and the clouds cast shadows over the fields, pasture, orchards, forests, hills and mountains. The mountains north and south of Hazar Golu still had smudges of snow on them, but they were smaller and fewer in number than two weeks earlier. 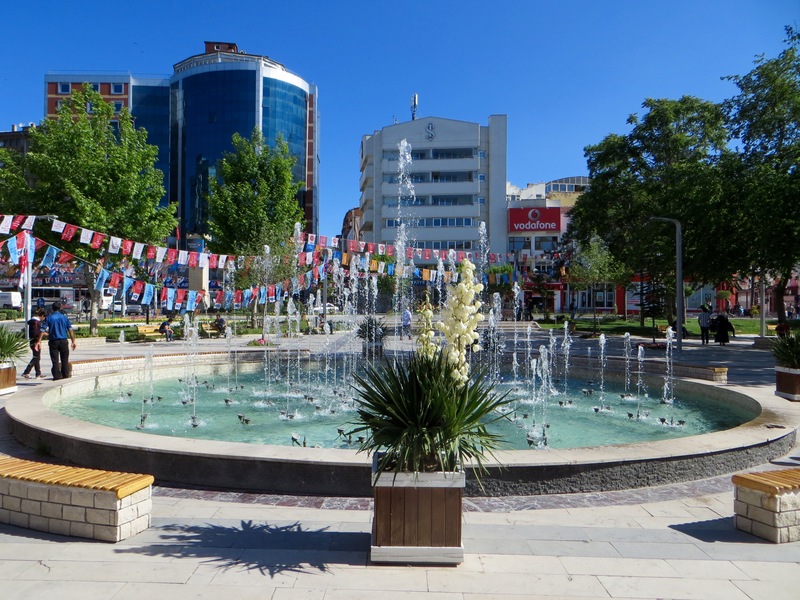 In Elazig, the railway station is conveniently located just a few blocks south of the main square, the otogar is not as far from the centre as in many cities of comparable size and even the airport is only 7 or 8 kilometres south-east of Gazi Caddesi. At first we followed the railway to Palu, Mus and Tatvan, then that line veered off to the east as we went south to Hazar Golu. The Elazig to Diyarbakir railway leaves Elazig from the south-west, then swings to the south-east to take a route along the very sparsely populated south side of the lake. It is only when the road reaches the east end of the lake and swings south-east for Maden that the railway and the road embrace each other so they can negotiate the direct but meandering route to Maden and Ergani. The small town of Gezin is the last settlement the road passes through before leaving Hazar Golu. Most of Gezin comprises of villas that are the second homes for city slickers who love the lake and its surroundings. A few businesses line the main road and they are overlooked by a large modern mosque in the mock-Ottoman style with lots of domes and semi-domes of different sizes. A short distance beyond Gezin, the hills and mountains embrace the road and the railway and the very pretty run to Maden begins. Forest, pasture, beehives and villages on the valley walls add to the pleasure gleaned from watching the railway make progress south via short tunnels, bridges and cuttings. Lots of yellow flowers still grew, but for how much longer? The deep red poppies of Dersim came to mind and I wondered how many were still in flower. So delicate did they look that the poppies’ petals reminded me of butterflies’ wings. Just before Maden station, the minibus stopped at a roadside lokanta and small market where people were preparing gozleme and meat dishes such as patlican kebaps. A large pile of melons from Adana, some of the first such fruit of the year, were examined by families who had stopped in their cars. 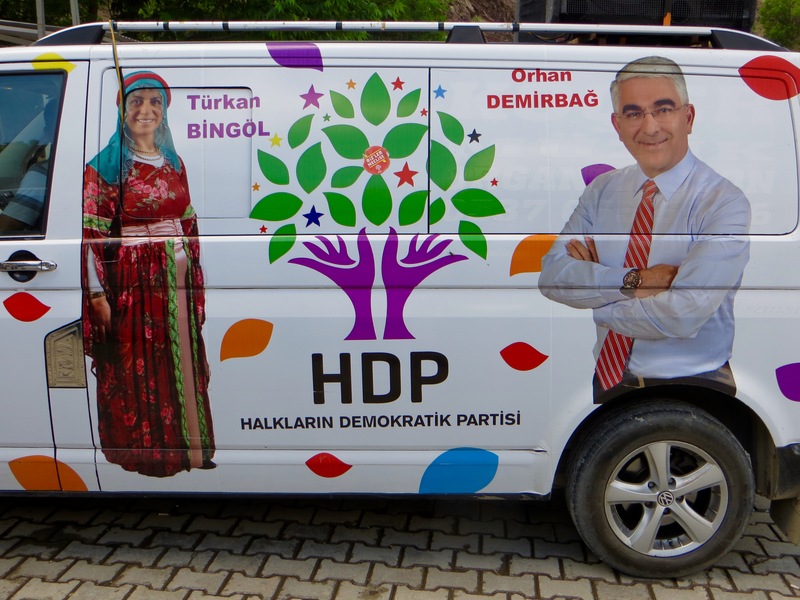 A white van hired by the HDP pulled into the car park and I chatted with its occupants. One of the occupants was a woman aged about forty dressed in traditional Kurdish clothes. She was the same person who featured in a picture on the exterior of the van itself. 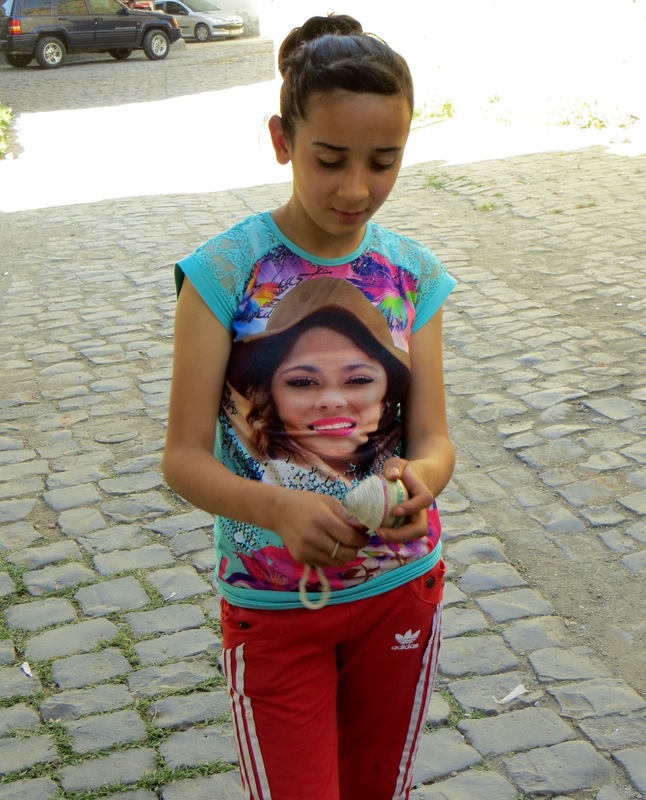 She was going to Diyarbakir to take part in an HDP rally during which she would sing and dance. She was ready to go on stage as soon as she arrived at her destination. As always, Maden’s location in a deep valley with houses stacked on the hillside above the railway and the river made me want to get out to look around, but I could not do so now with bags heavy with booty for home. Flights of stone and concrete steps meandered among the buildings to provide pedestrians with short cuts from one group of houses to the next. Shadows fell across the heaps of spoil that confirmed how important mining had once been. For a town with an official population of not much more than 5,000, Maden appeared to have a lot to offer its visitors. Between Maden and Ergani the bus boy brought everyone something to drink so I had a fruit juice. Makam Dagi and the large cement works confirmed that we were approaching the northern edge of Ergani, from where the scenery took on a more worn-out appearance with rounded hills in the distance and the plain assuming the first shades of brown redolent of the long, hot summer ahead. The road, a dual carriageway from Ergani almost all the way to Diyarbakir, allowed us to get to the northern suburbs of our destination very quickly, but it was then that we meandered through the extensive new suburbs to the main otogar dropping people off as we did so. 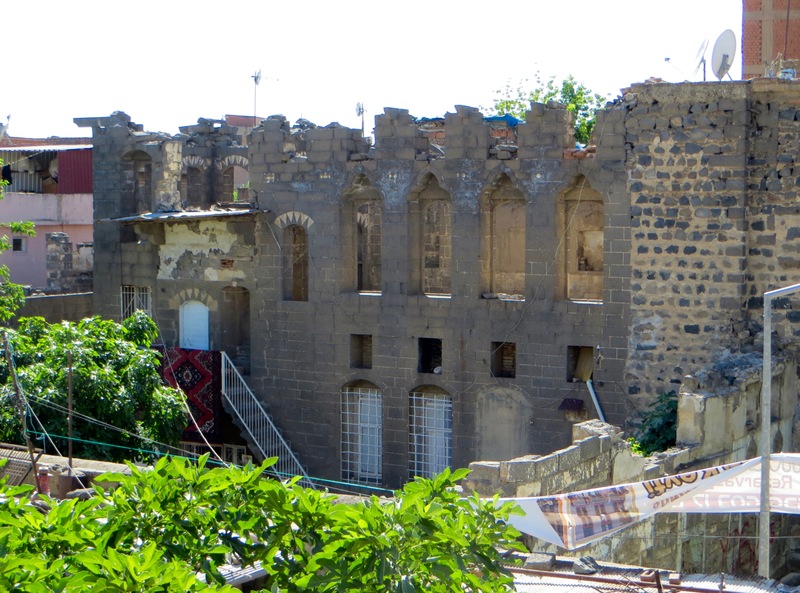 The meandering drive through the northern and western suburbs of Diyarbakir was other-worldly. Most of the buildings (the first few are encountered in ones and twos, but further into the city they are clustered together en masse) are very new, very tall (blocks with at least ten storeys are many in number), carefully designed (balconies of generous proportions are common-place) and brightly painted. Where such buildings cluster together they are invariably clones of one another, but there is something compelling about the views they create, even though they are the opposite of all that I like best about architecture in the Middle East (it is this alien character of the new suburbs that makes them other-worldly, of course). The buildings lie along new roads, some of which are wide and dominated by curves and roundabouts, the latter at intersections. Families wealthy by local standards occupy some of the apartments. The ground floors of many of the apartment blocks have businesses in them and, in time, the suburbs will emerge as places where local people can meet most of their routine needs without having to visit the city centre. Some of the most impressive businesses are large lokantas and cafés with ultra-modern air conditioned interiors and outdoor patios raised above the level of the pavement. Family groups sat on the patios enjoying a very late breakfast or very early lunch (in fact, some such groups may have been eating brunch. The suburbs are not without their American characteristics). 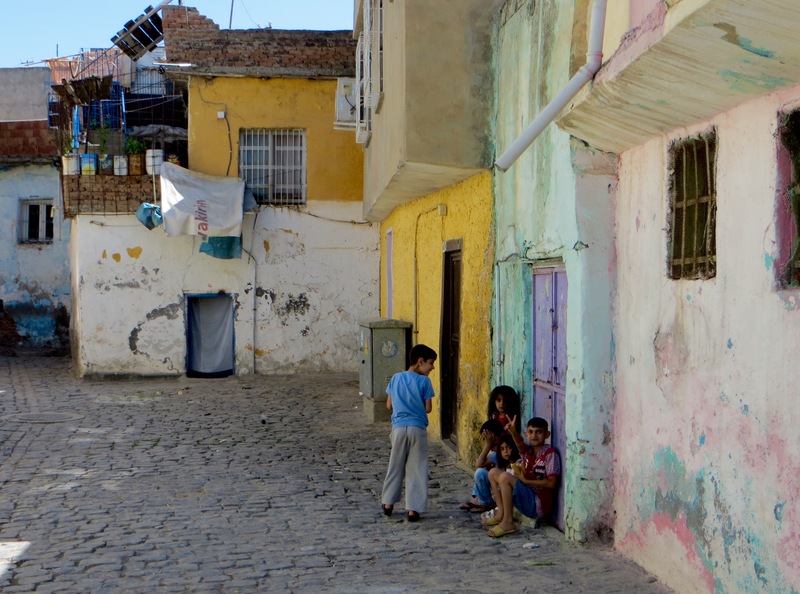 Blink, and the suburbs of Diyarbakir could have been in parts of Mediterranean Europe. 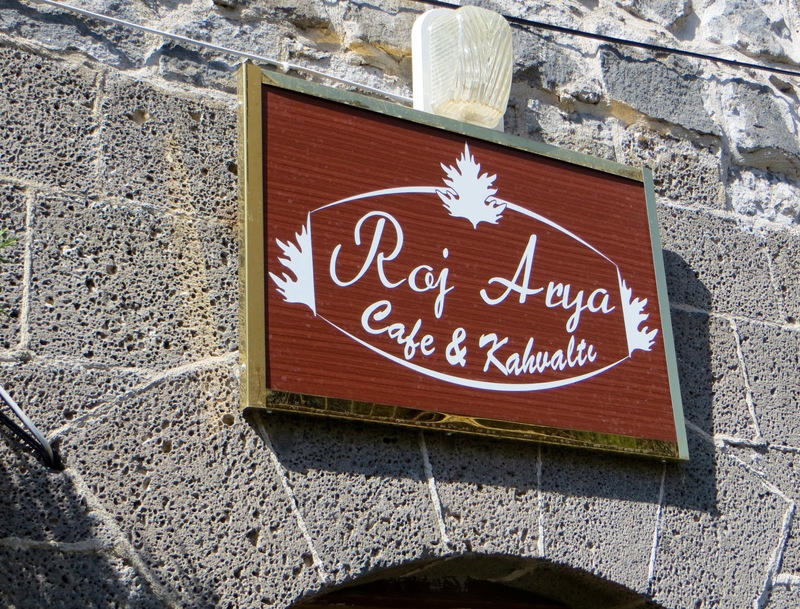 Moreover, it was obvious that some of Diyarbakir’s best dining experiences are now in the suburbs and not in the old city or the streets immediately enclosing it. 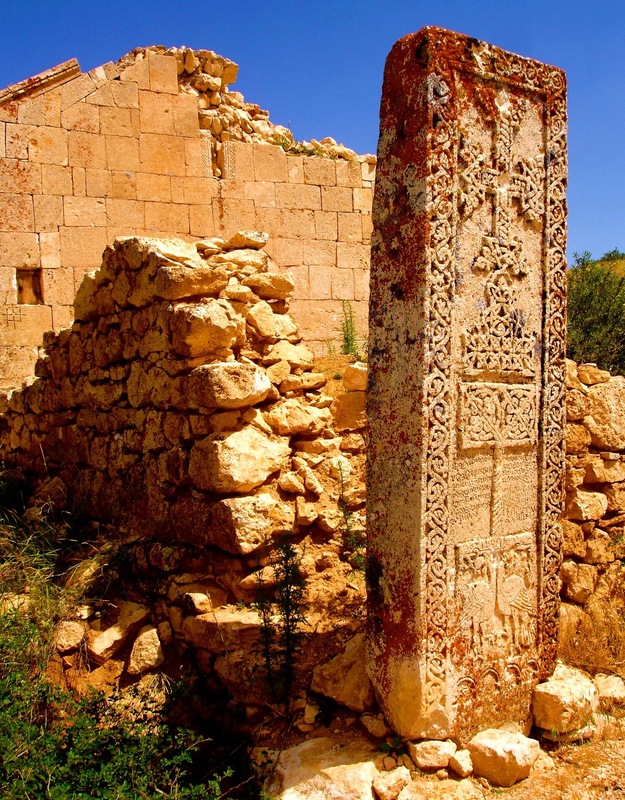 The benefits of the peace that has prevailed in the south-east for some years impressed themselves in a manner as substantial as that of the Syriac Orthodox Christians who have returned to the Tur Abdin region around Mardin and Midyat. Inevitably, not everywhere surrounding the apartment blocks and other large structures such as offices and shopping malls has been landscaped, with the result that many families and office workers overlook patches of open space marred with litter and the debris of construction work. In time, of course, such open spaces will be built over or turned into parkland and/or playgrounds, and very large billboards had helpful artists’ impressions of what the brave new world will eventually look like. 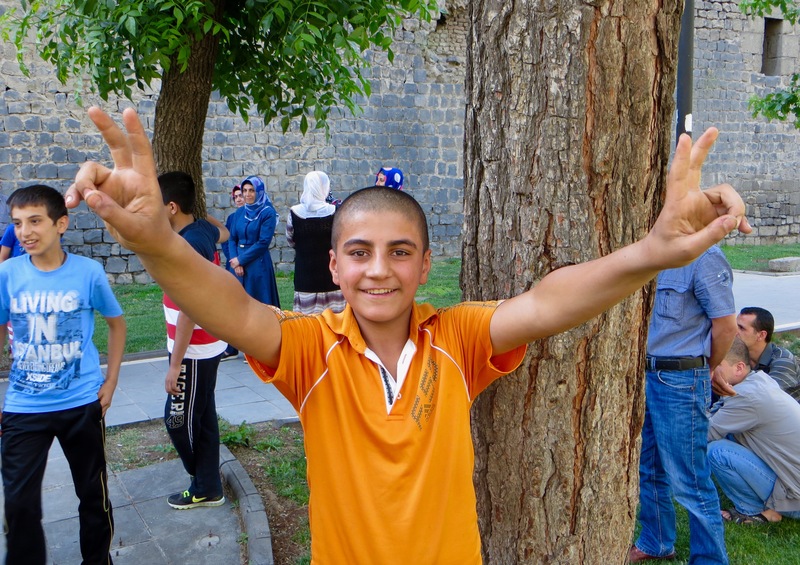 My heart inclines toward the old city, inevitably, despite its considerable challenges in terms of overcrowding and economic decline, but I can see the appeal of Diyarbakir’s new suburbs, especially for Kurds in the region who, for the first time ever in many families, are encountering economic security and well-being. We arrived at the newish otogar, itself increasingly enclosed by the brave new world of wide boulevards and large structures with brightly painted walls, and some of us transferred to a servis bus that took us to the edge of the old city through streets busy with pedestrians and motorised traffic. I had a cunning plan. I would identify a small hotel where rooms came with en suite facilities where I could leave my bags and wash and rest when I wanted, then check out at about 9.45pm. With the temperature about 30 degrees centigrade and likely to rise another degree of two by 4.00pm, I knew I could not get to the airport feeling and looking presentable without at least one shower. 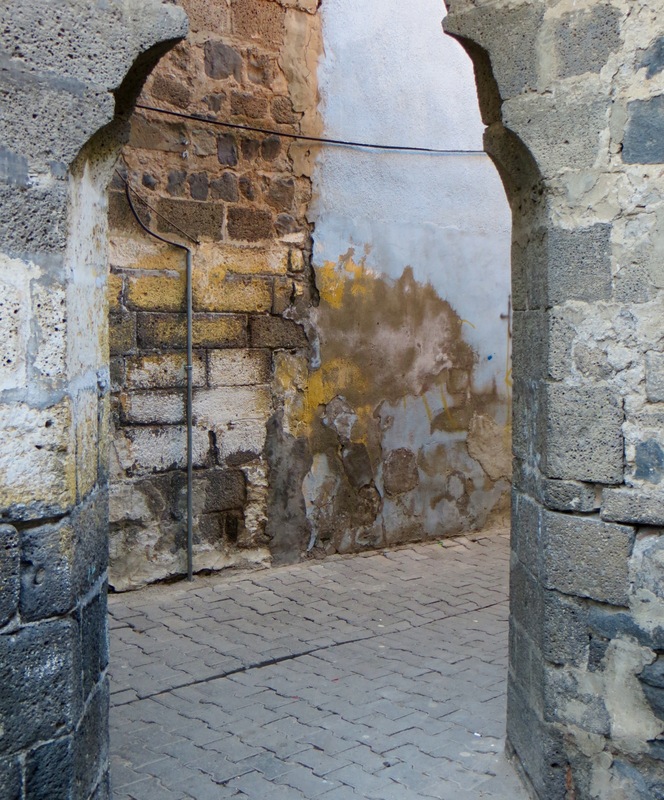 I also wanted to have a good look around the old city, which would inevitably mean I would get a bit grubby. I found just what I wanted between Kibris Caddesi and Inonu Boulevard. Moreover, the hotel was about 150 metres from where taxis left for the airport for a very reasonable flat fare. I showered and changed into grubby but still presentable clothes to keep clean the clothes I had travelled in from Elazig (the clothes worn in Elazig and to Diyarbakir I would put back on for the journey home), then set off for the trip’s final good look around. Surp Giragos Church was my first destination. 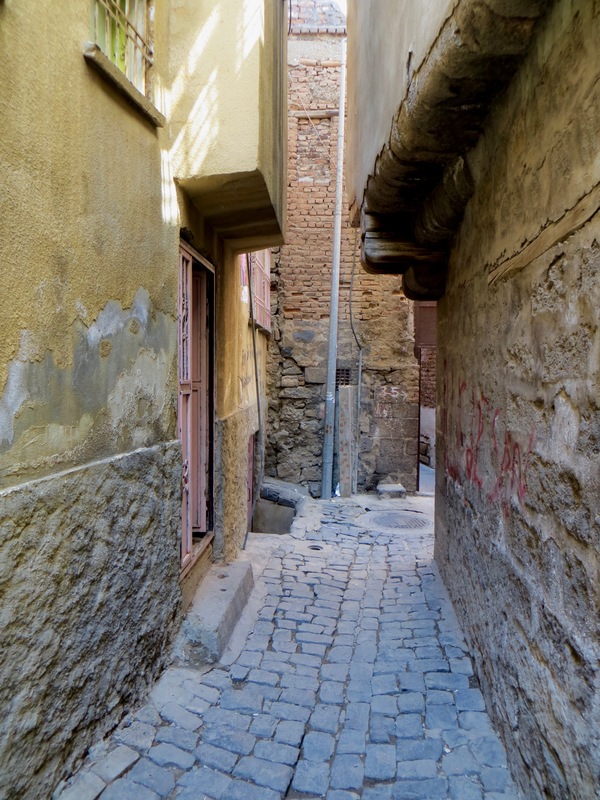 I made my way via the narrow streets of the old city east of Gazi Caddesi and south of Biyikli Mehmet Sokak. Harry R. Selverian on Elazig. philandre on To Keban and Arapgir. Seba on To Keban and Arapgir.